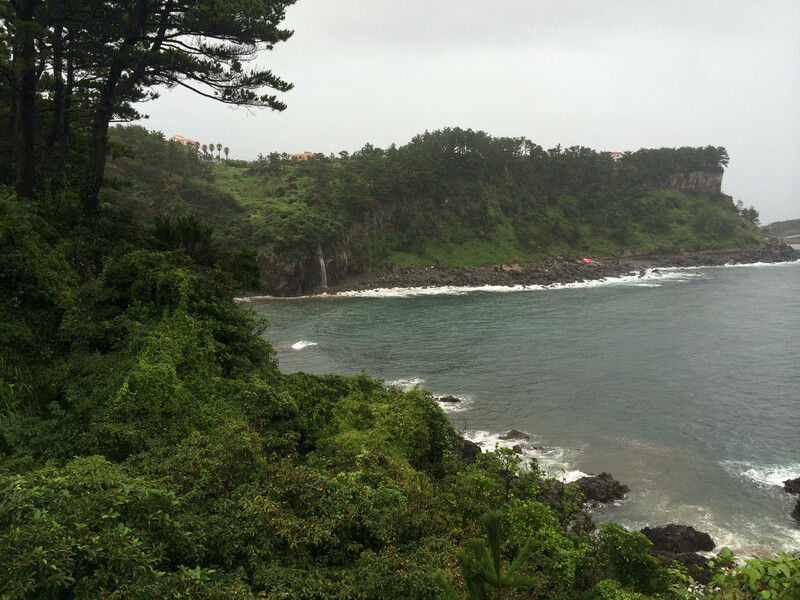 I was really excited to go to Jeju, South Korea’s largest island. 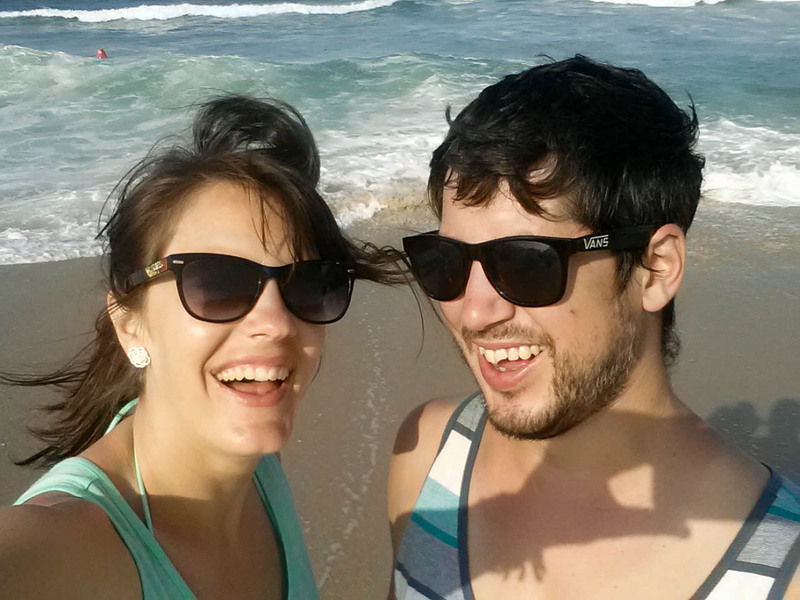 I couldn’t wait to see the blue skies, warm sunshine, beautiful beaches and the palm trees. We were saving the best for last on our summer vacation…or so we thought. Mother Nature decided we still hadn’t seen enough rain yet. 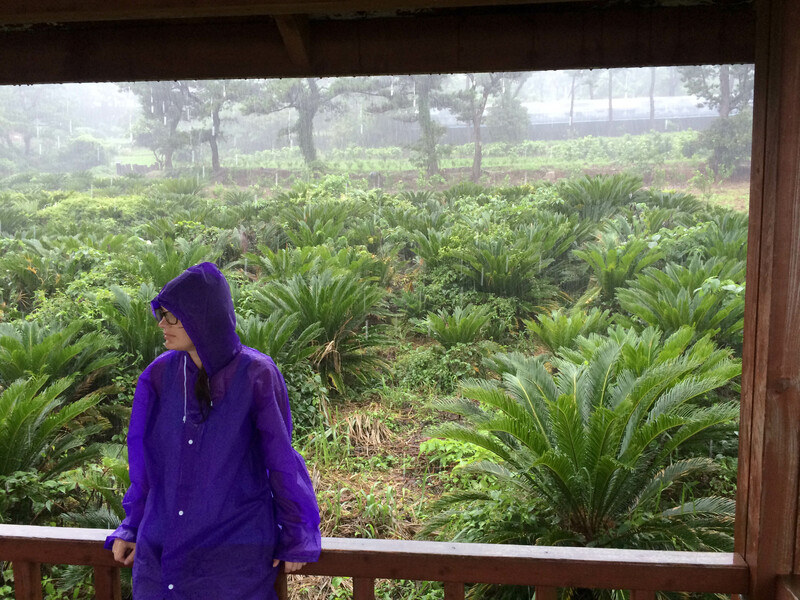 It rained, I mean poured, all but 30 minutes of our three day visit. No exaggeration. I’d like to say the weather didn’t stop us from doing everything we wanted, but it did. We were still able to have a great time, we just didn’t see nearly as much as we’d hoped and there certainly wasn’t any beach time. Perhaps just another reason to go back someday. 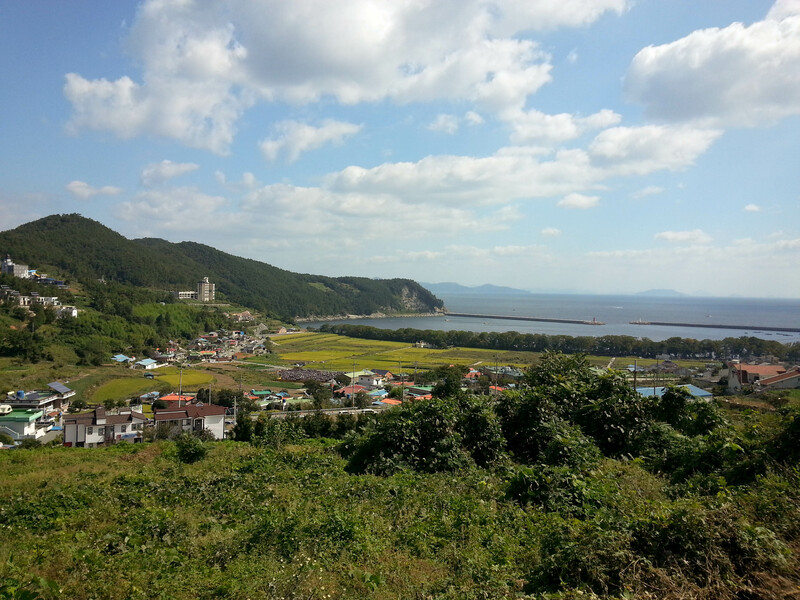 Jeju is accessible by ferry (about 10 hours, depending on which port you depart from) or a short flight from one of Korea’s airports. 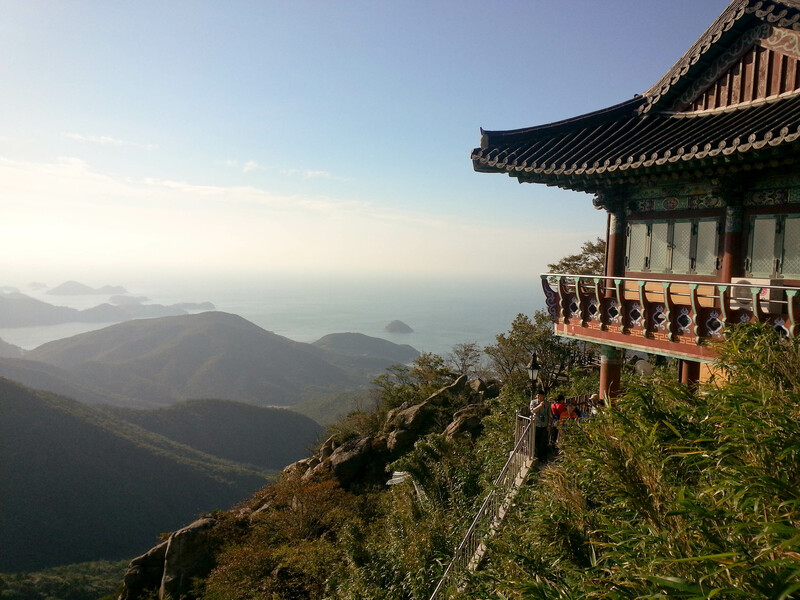 We chose the latter and took a 40 minute flight from Busan. 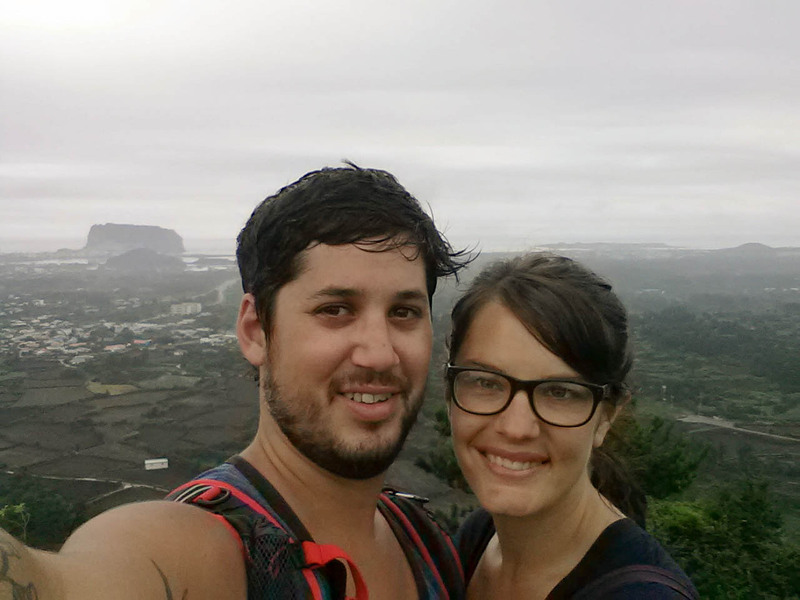 We had difficulty deciding where to stay on the island since we wanted to see quite a few different things that were spread out over the island, and we knew we’d be using public transit. 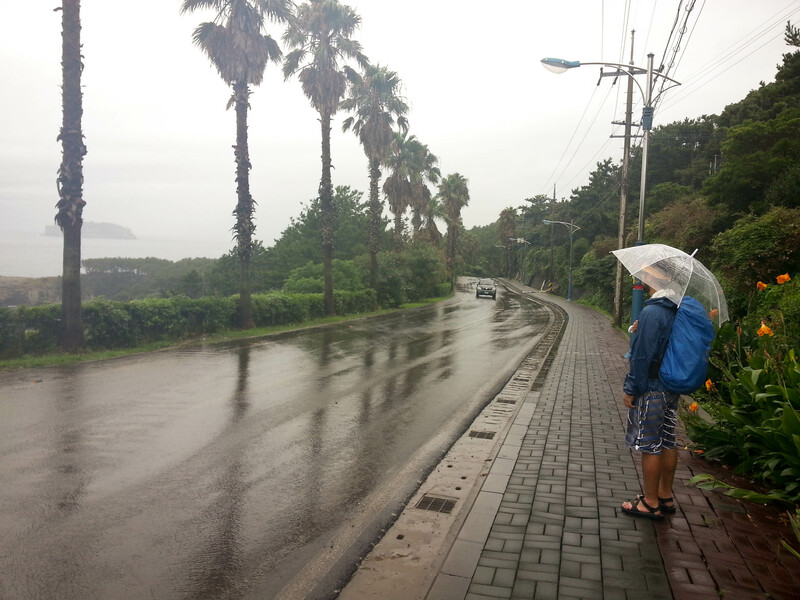 In the end we went with The Forest Hostel in Jeju City. While we had an okay stay at this hostel, I wouldn’t necessarily recommend it. Our room had an endless supply of giant, hungry mosquitoes and it smelled like a pile of dirty, damp towels. 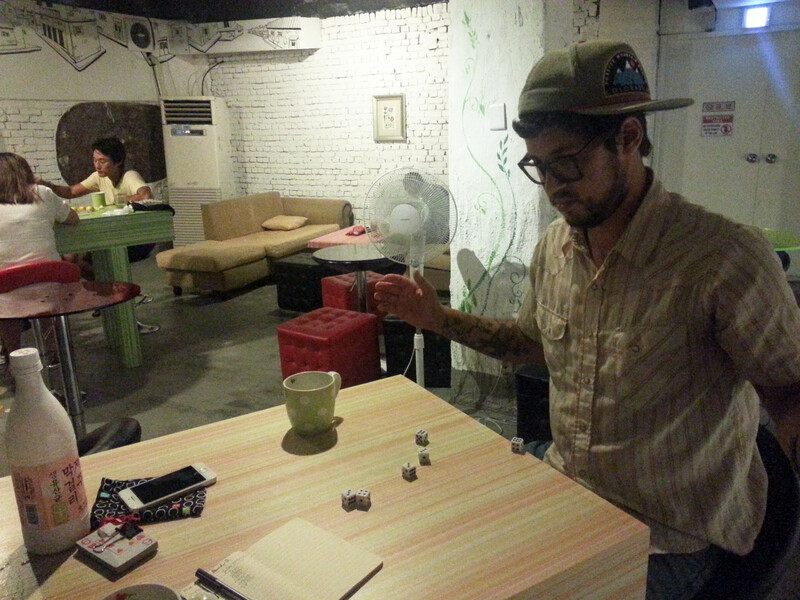 But, there was a nice common room and the owners were pleasant. 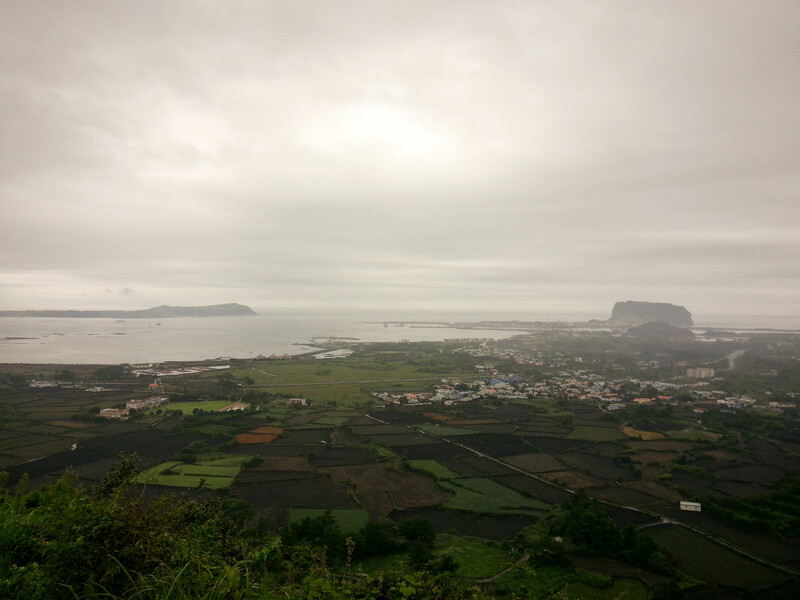 The unfortunate thing about using public transportation (buses) on Jeju is that is takes several hours, one way, to get to the other side of the island, and many of the sites we wanted to see were not within close proximity to each other. 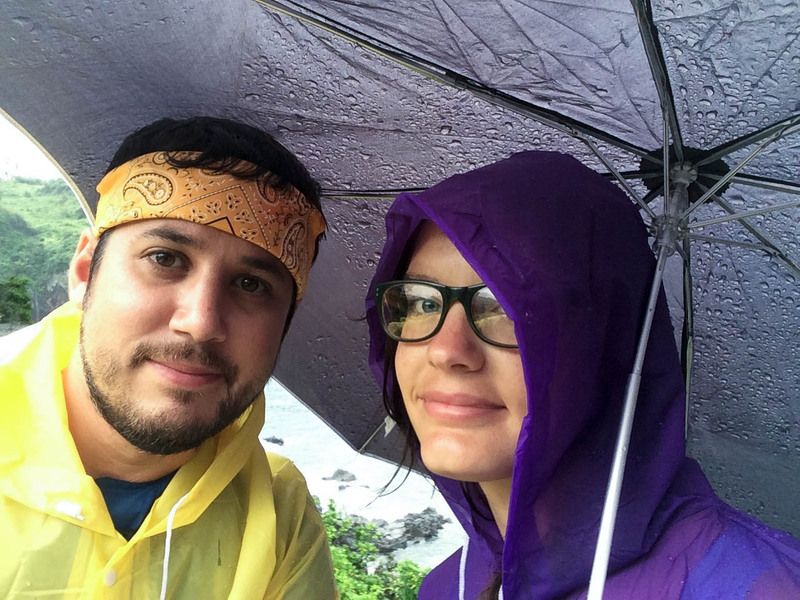 We tried to be strategic about making an itinerary since we were a little restricted by bus timetables, but the crummy weather made it even more challenging than anticipated (mostly because we found ourselves getting tired of being wind blown and soaking wet). 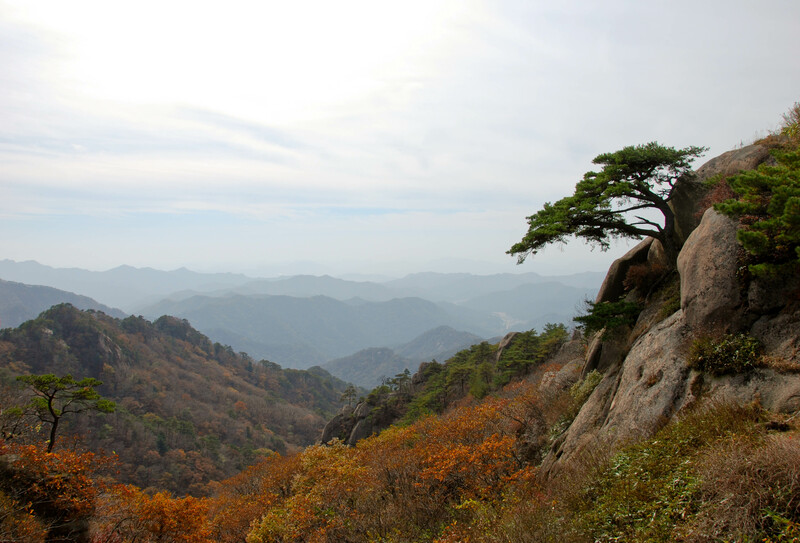 We planned on hiking Hallasan, South Korea’s tallest peak (yeah, yeah, it’s only 6,397 feet high but it’s still a mountain), but we opted not to due to really strong winds, sideways rain and lightning. 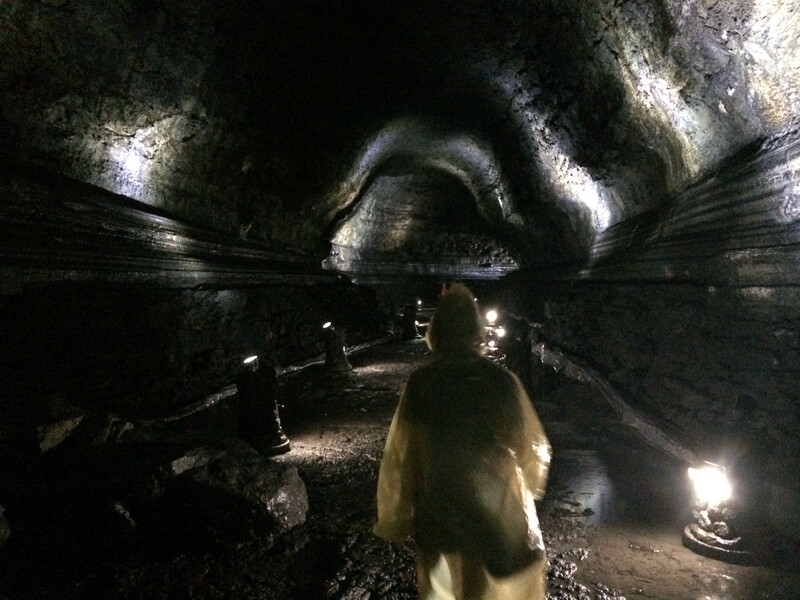 Instead, we went underground and explored Manjanggul Cave, one of the most impressive lava tube systems in the world, and checked out some of the beautiful Jeju Olle Trails that go around the perimeter of the island. Oh, and cannon balls into the sea as well. 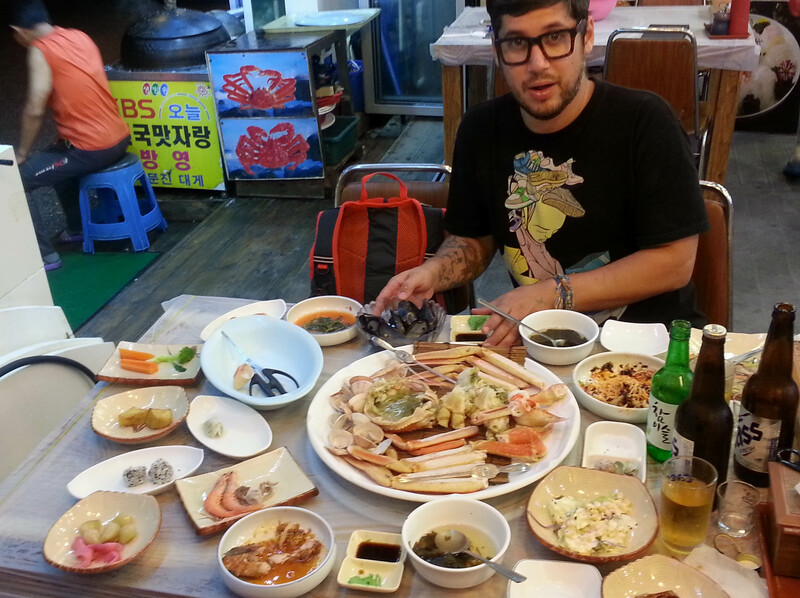 Surprisingly, we didn’t indulge in seafood on this leg of the trip. 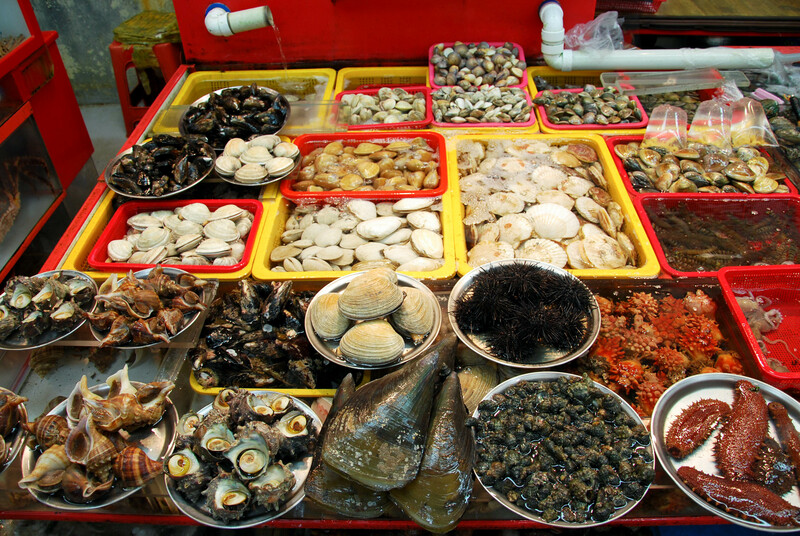 We were on an island and didn’t eat seafood, really? Yes, really. 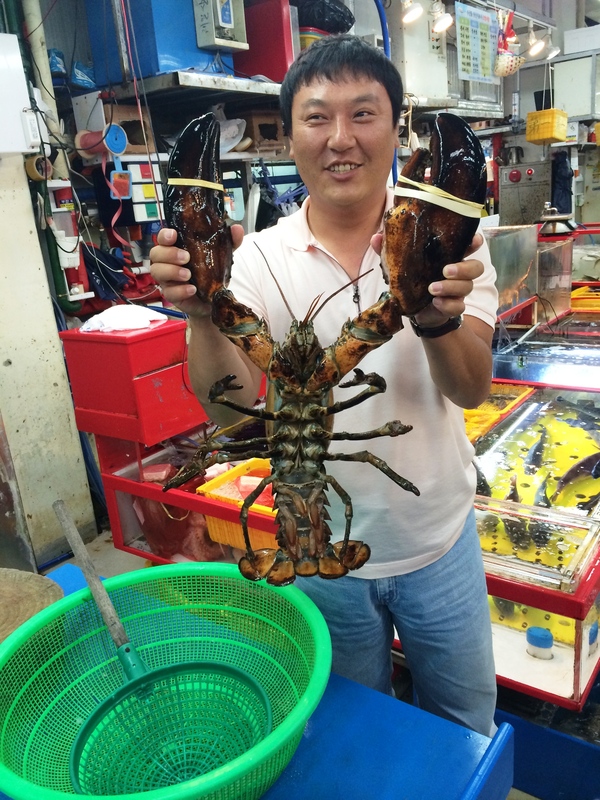 We decided we’d splurged enough on fresh seafood in Gyeongpo, and after trying Jeju’s famous black pig barbecue on our first night (a species on Jeju known to be more tender than others), we decided it was so good we had to go back the next night too. Even though the trip didn’t go as planned and we didn’t get to cross everything off the list, it was still unforgettable and an excellent experience (largely do to a great travel companion). I’ll let the pictures do the rest of the talking. 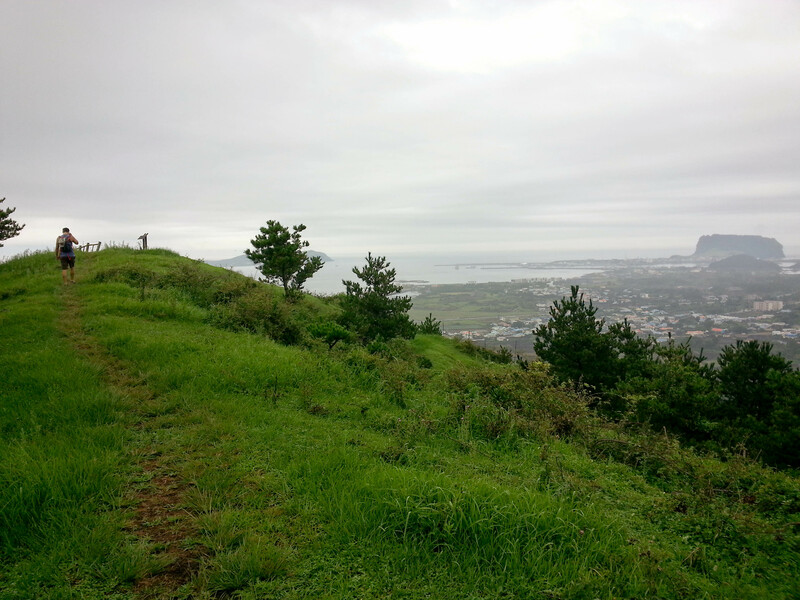 Welcome to beautiful Jeju Island. 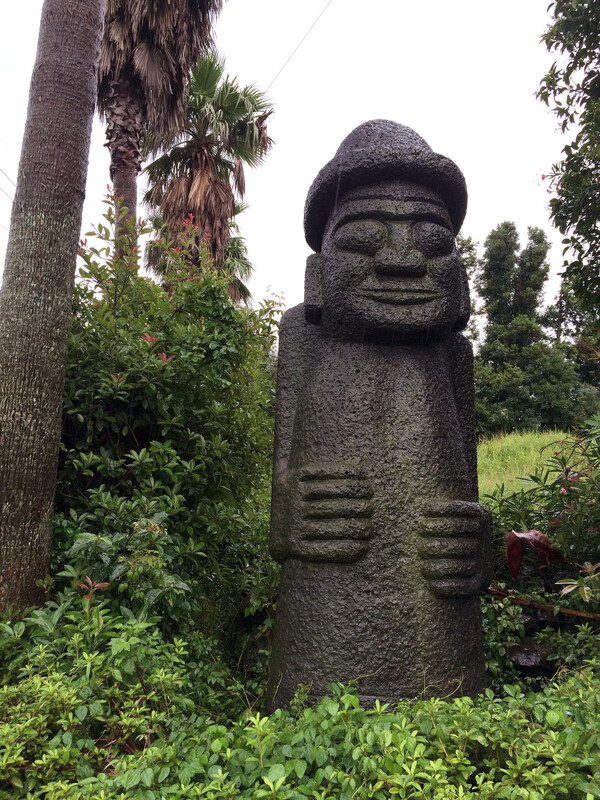 Dol hareubangs (roughly meaning stone grandfather), which are statues carved from volcanic rock, can be spotted all over Jeju. 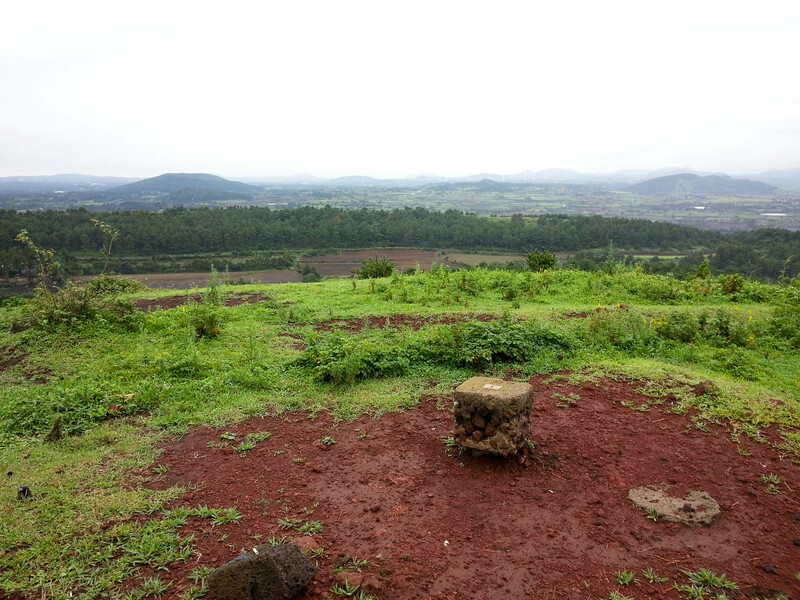 Traditionally, they were carved and placed at village entrances to provide protection. 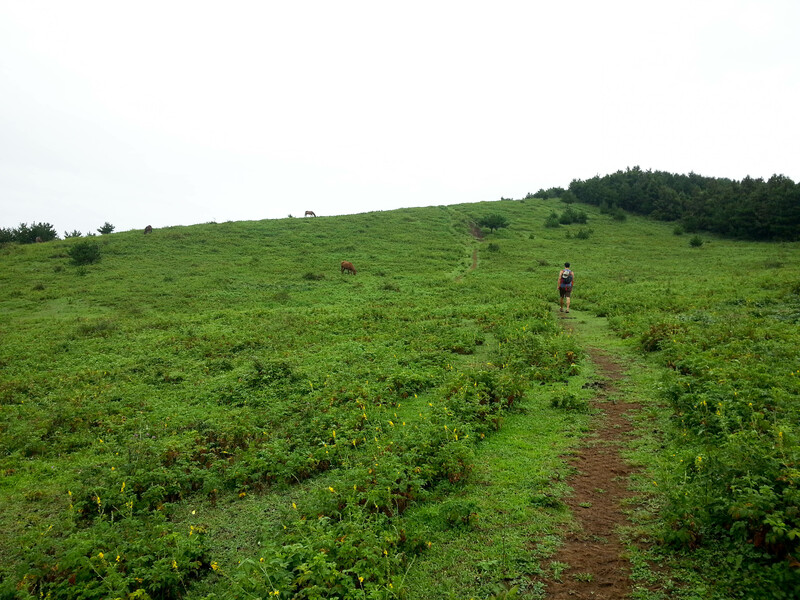 The trailhead for Jeju Olle #1. 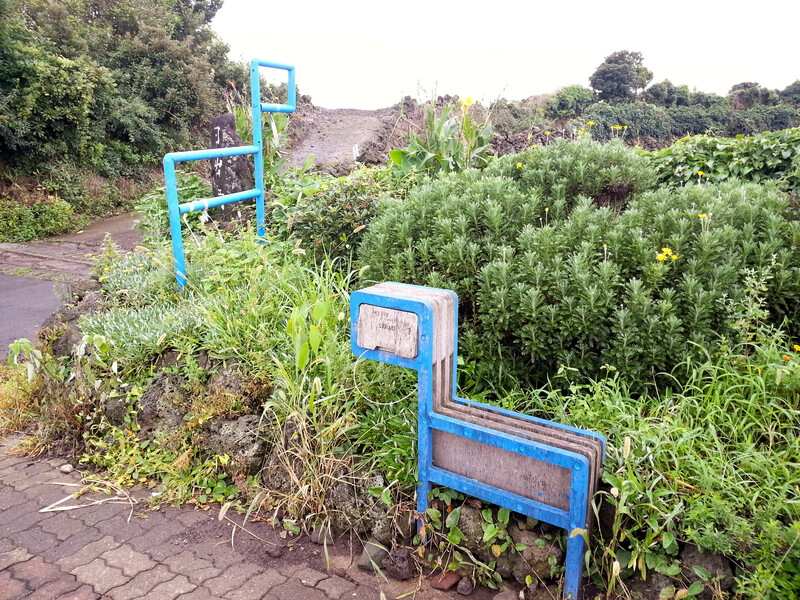 There’s a stamp inside the box at the bginning of each trail which you can use to stamp your Jeju Olle “passport”. 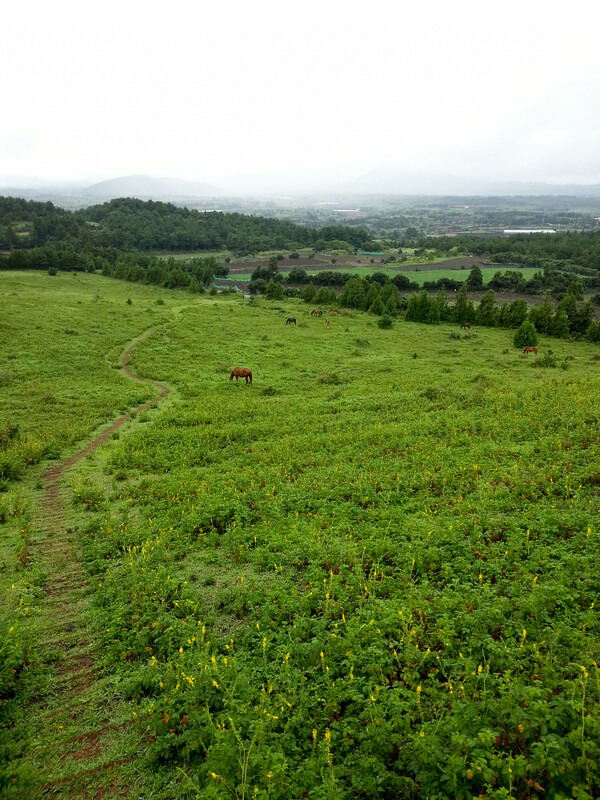 Fields and wild horses along Jeju Olle #1. This is when we had a 30 minute break from the rain. The dirt/mud on the island was such a brilliant color. More of trail #1. I love how green it was. 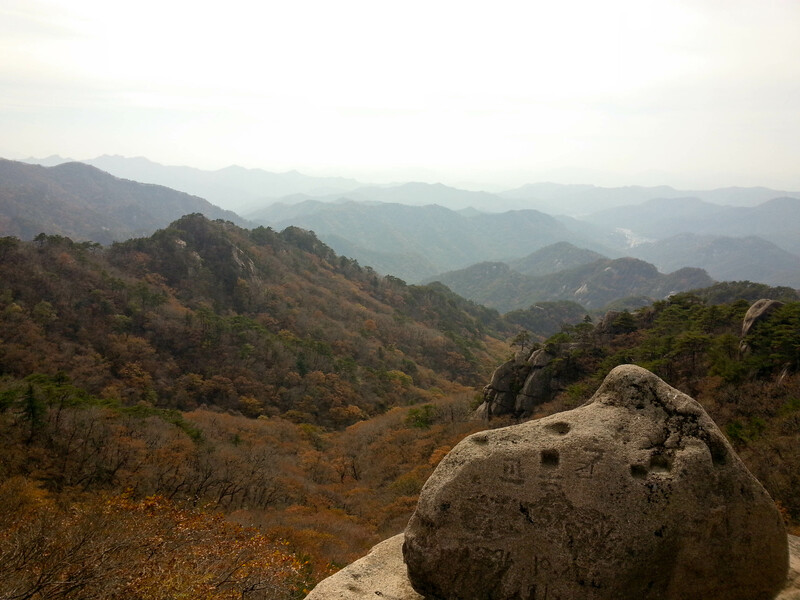 View of Seongsan Ilchulbong from trail #1. 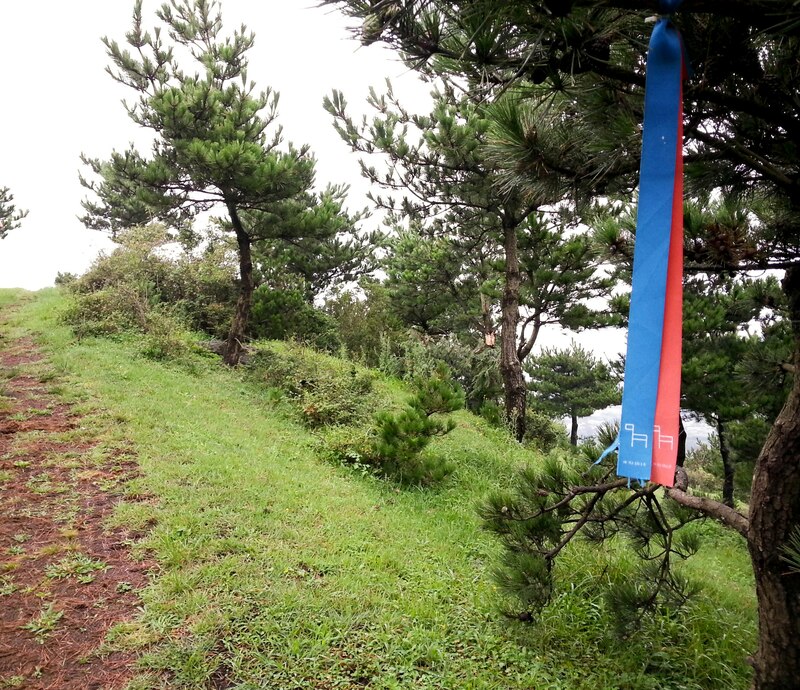 The Jeju Olle Trails are marked with these blue and red ribbons. We hung out under this pavilion for a while to see if the storm might pass. Nope, it was there to stay for several days. Lucky for us, cheap ponchos were for sale everywhere. 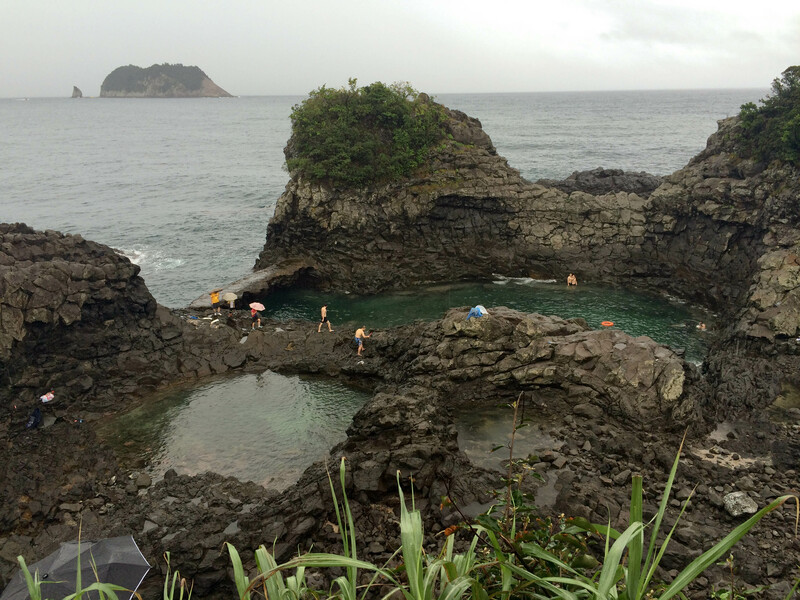 Despite the rain, we stumbled upon this swimming hole in Seogwipo. 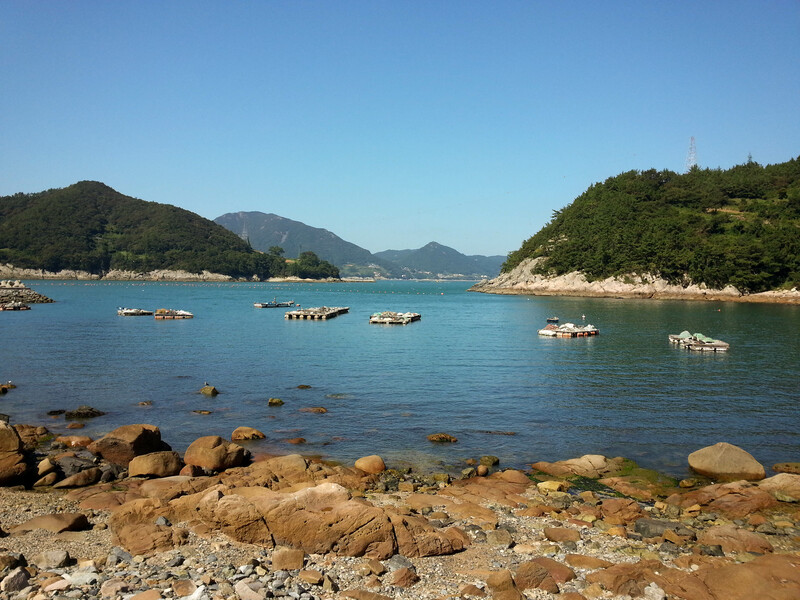 Panorama of the lagoons near Oedolgae Rock in Seogwipo. 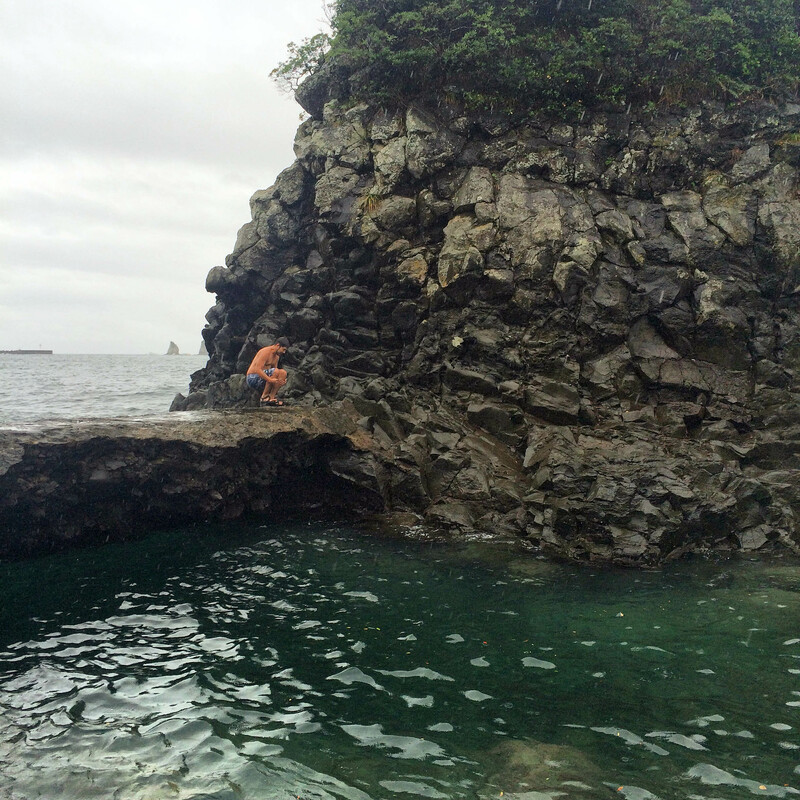 David doing a cannon ball into the lagoon near Oedolgae Rock. Oedolgae Rock stands 65 feet above what is usually turquoise water (but not on this day due to the storms moving though). 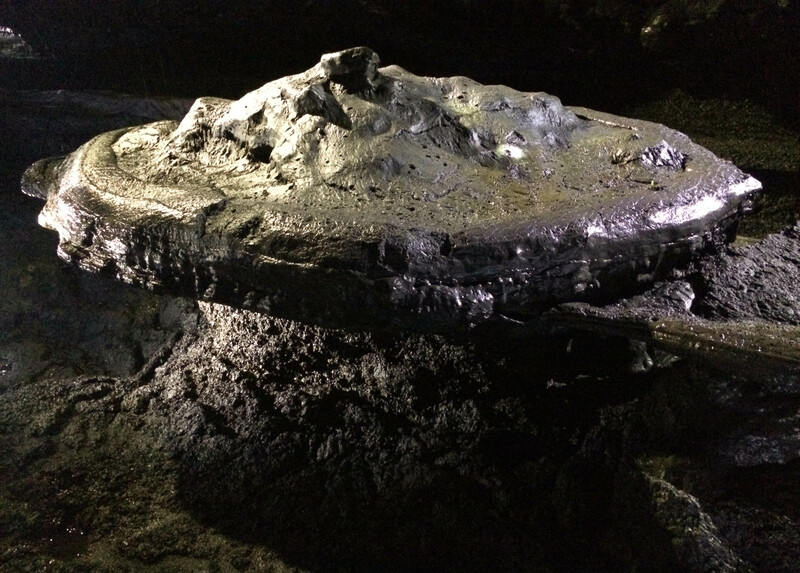 It was formed by a volcanic eruption 1.5 million years ago. 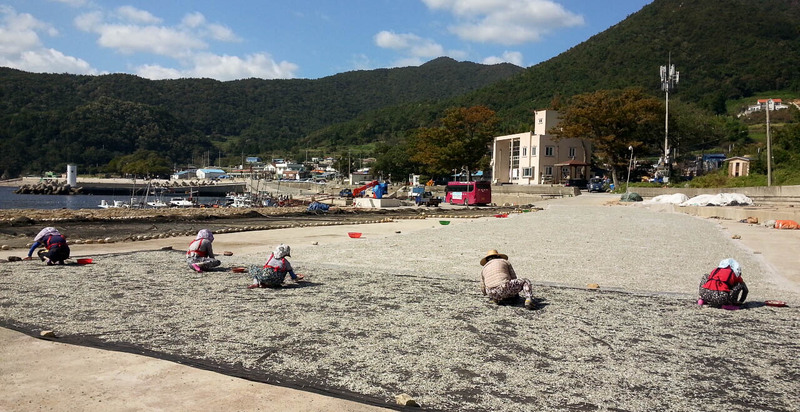 According to legend, an old woman became the rock after waiting for her husband who went out to sea to fish and never returned. 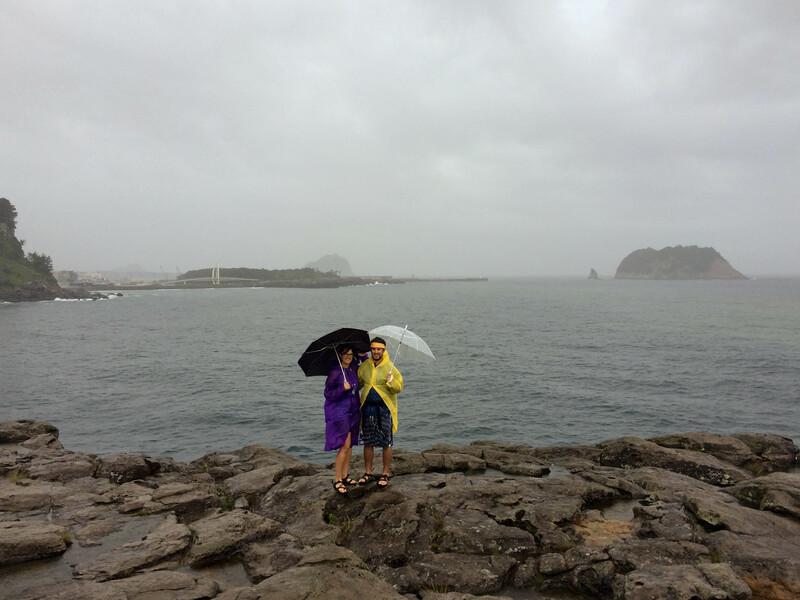 A young Korean guy offered to take our picture. We didn’t realize it was going to be a mini photo shoot. He took at least 20 photos from all different angles. 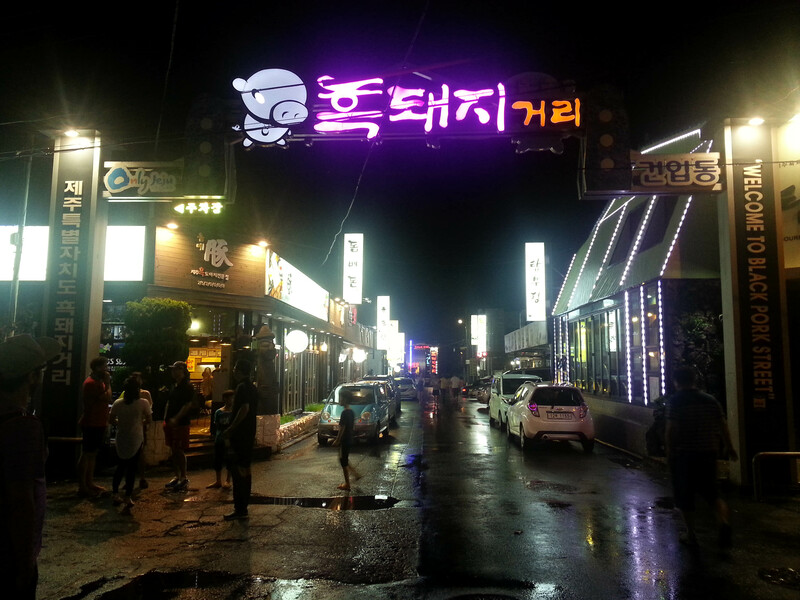 Black pork street where you can find an abundance of restaurants specializing in Jeju’s black pig. 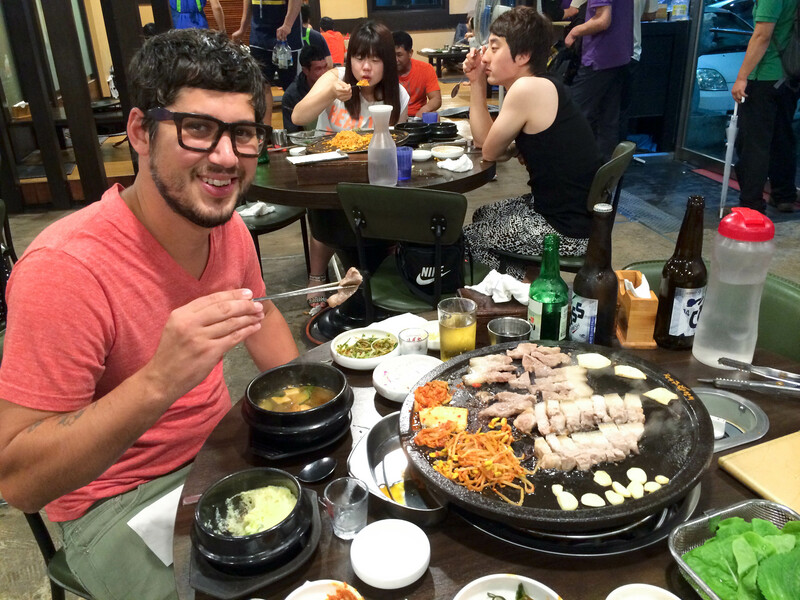 I think David was very happy about this Korean barbecue experience. Mmmm. 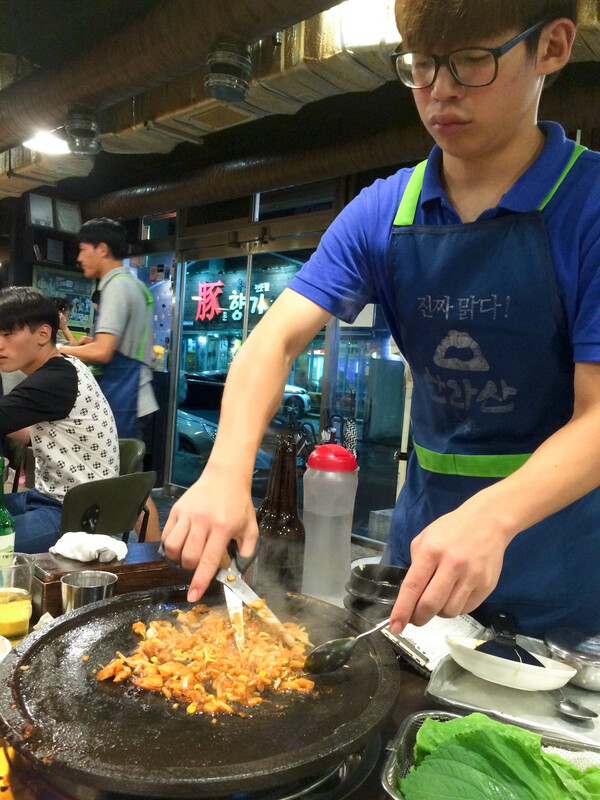 Mushrooms, pork, kimchi, garlic, and bean sprouts sizzling right at our table. 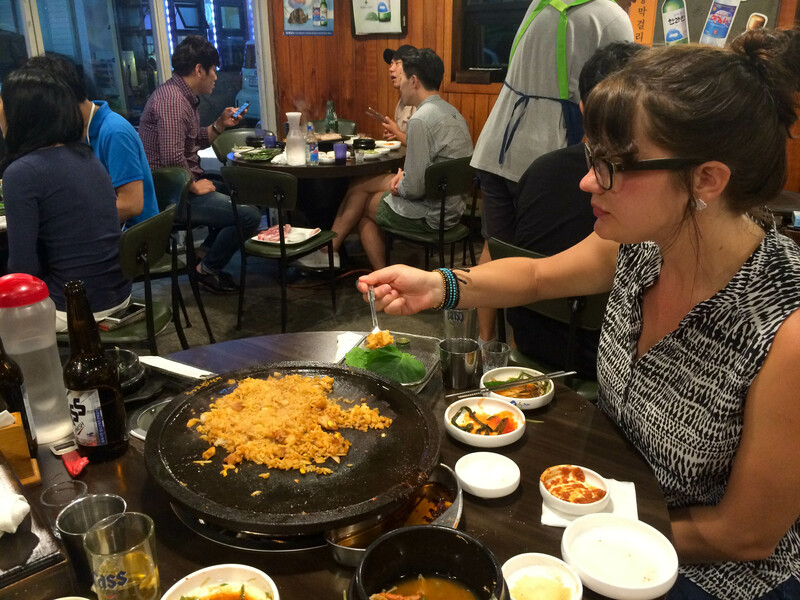 When ordering bokkembap (fried rice), they use the bits of remaining meat, garlic, kimchi and onions that are on the grill and mix it with rice right at your table. 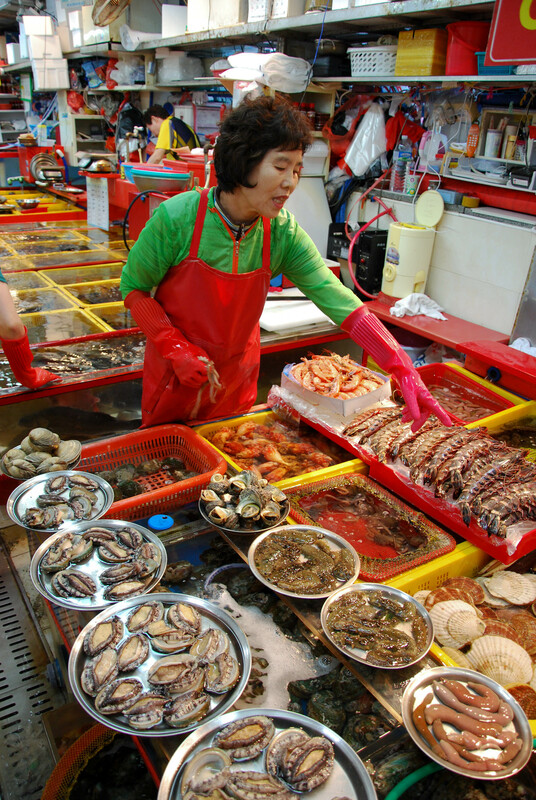 They usually add dried seaweed as well. Also, you’ll notice he’s using scissors, the knife of Korea. Testing the fried rice. It was delicious! 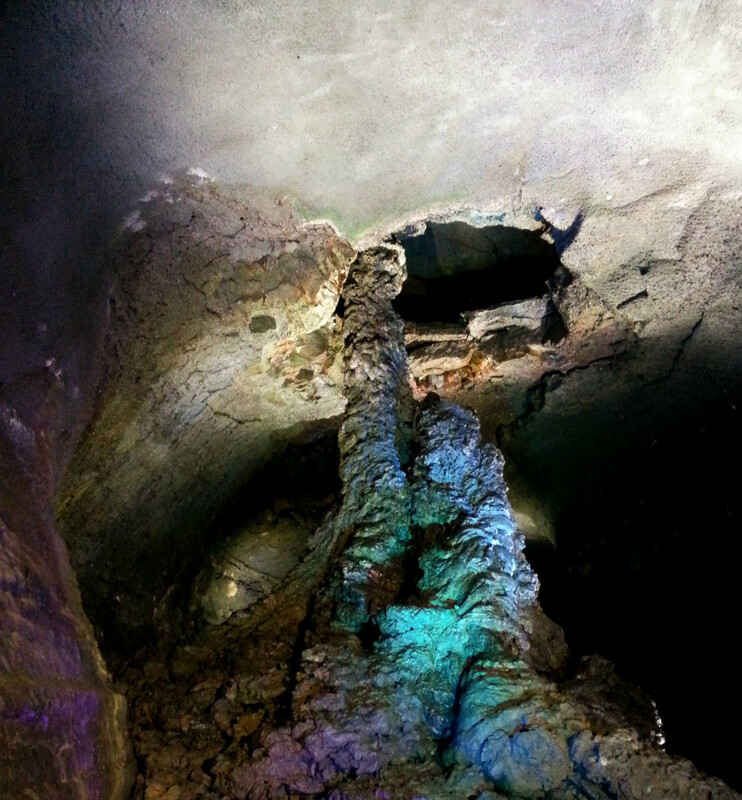 A lava formation that looks a bit like a mushroom in Manjanggul Cave. 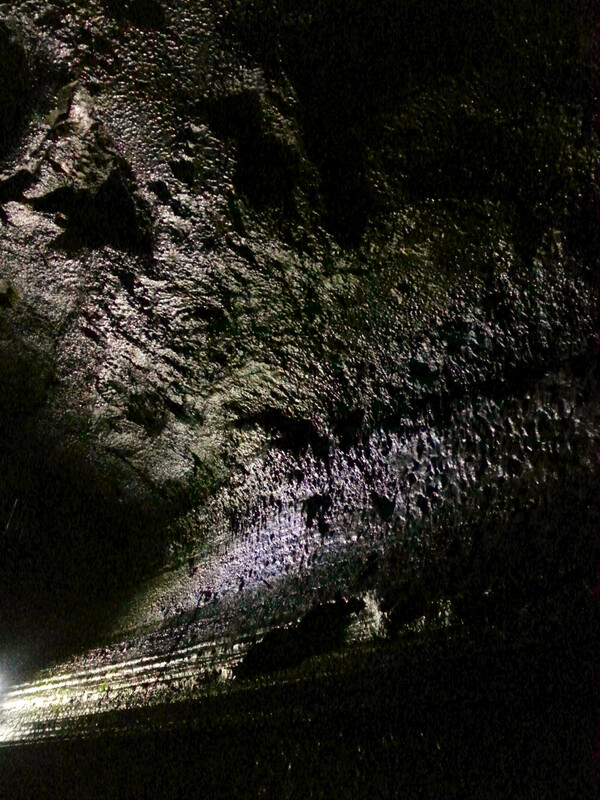 Formation at the end of the lava tube (or at least the part that was open to tourists). 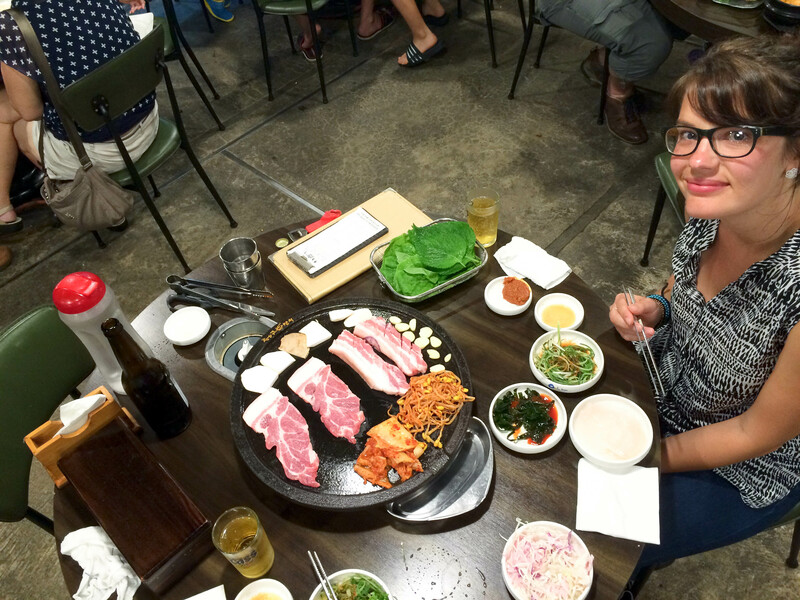 More Korean barbecue because it tasted so good the first night. 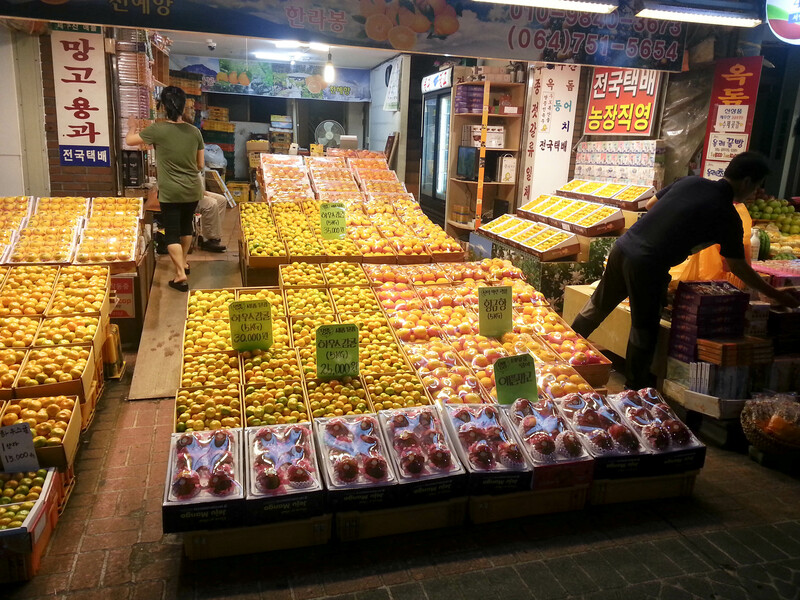 Jeju is known for mandarins, tangerines and hallabongs (a cross between an orange and a tangerine). 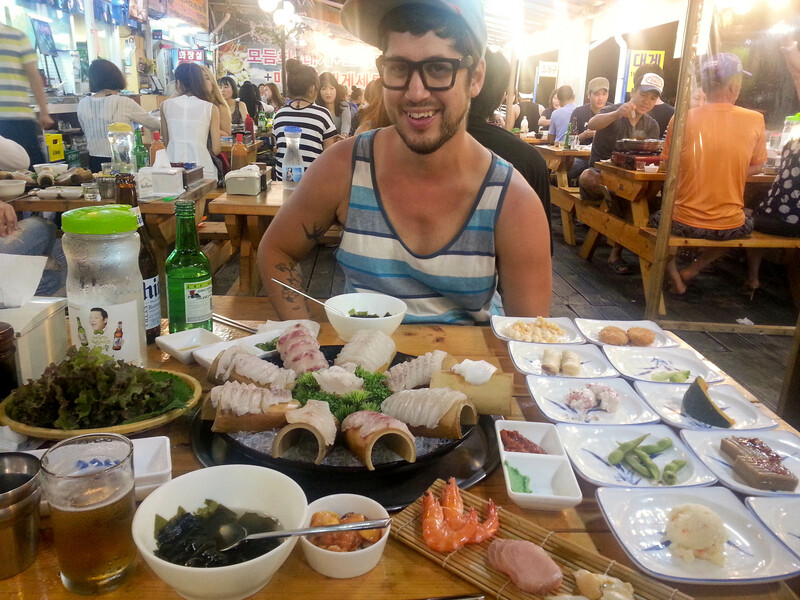 Squid and giant plates of really cheap sashimi at the fish market near our hostel. We got some game time in while drinking tangerine flavored makgeoli in the common room of our hostel because, well, it was still raining. 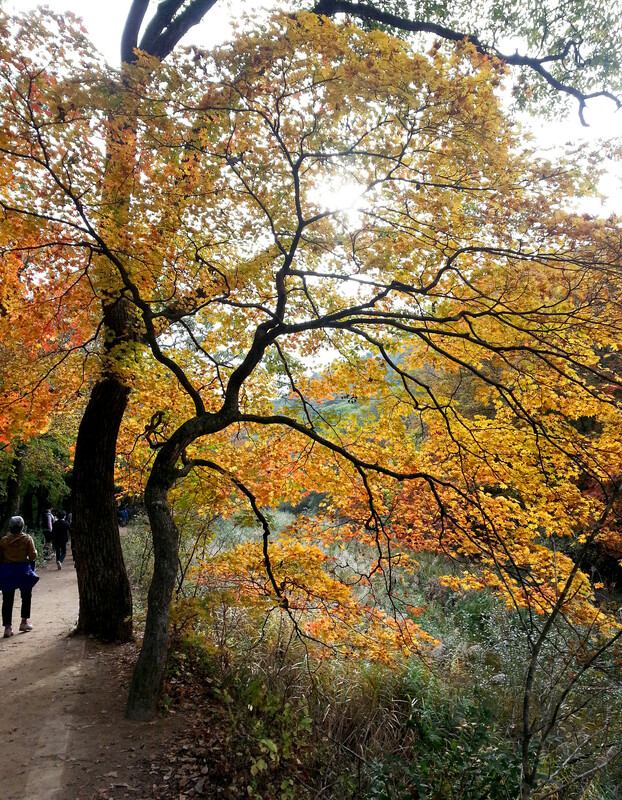 I went hiking in Songnisan National Park last weekend to catch some of the fall foliage. 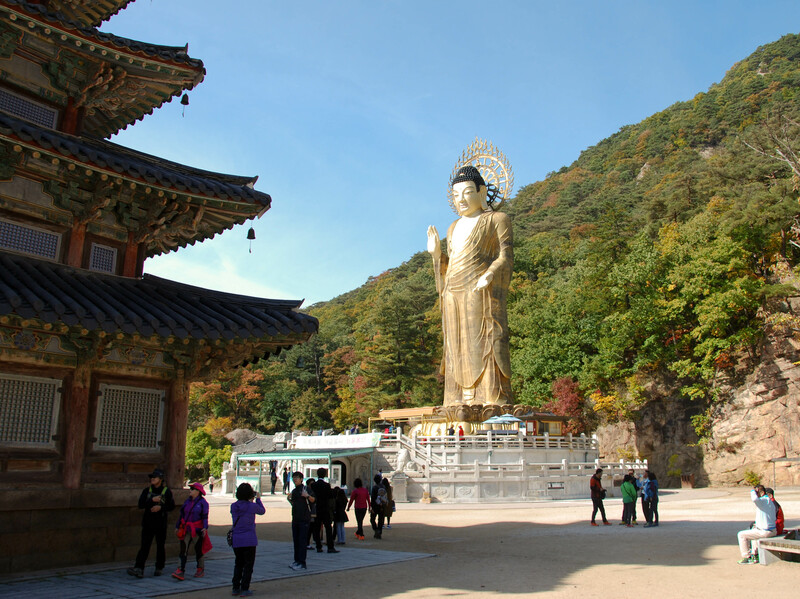 Maitreya Buddha stands 33 meters high at Beopjusa Temple. 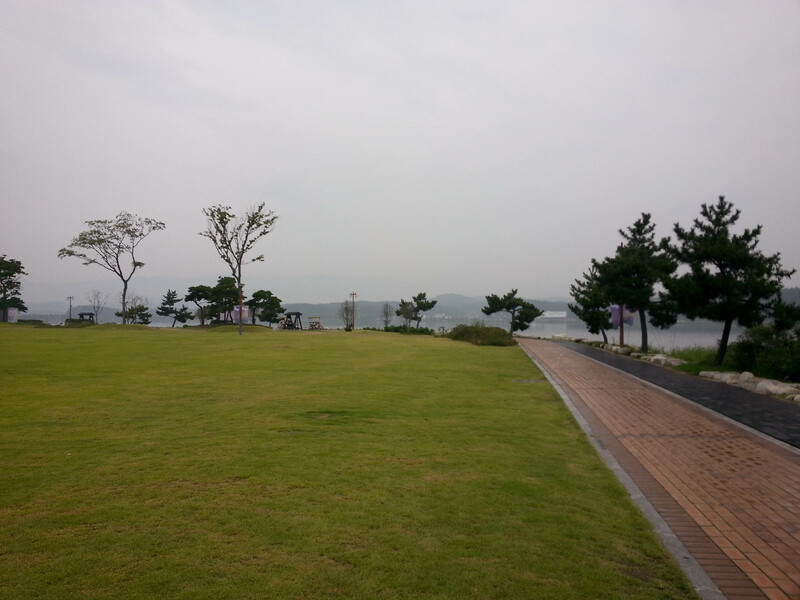 It was a busy day at Songnisan National Park. I found this cool little guy just hanging out at the temple. 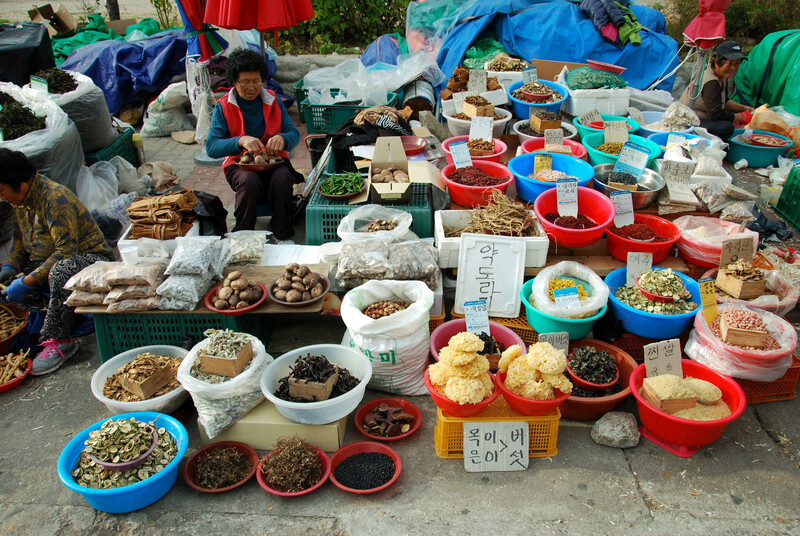 Women selling goods outside the entrance to Songnisan National Park. 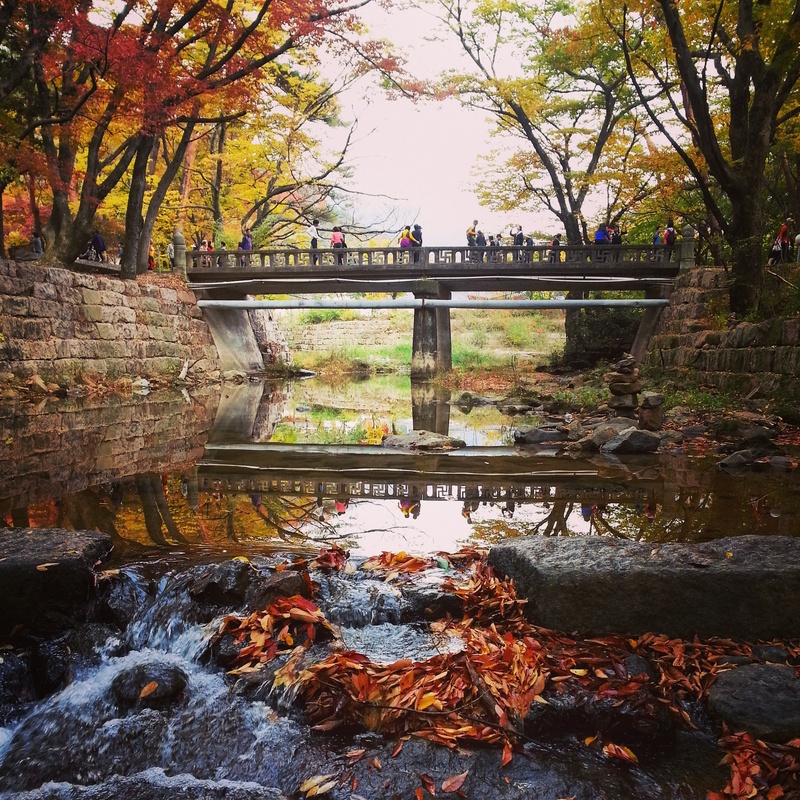 Fall is such a beautiful season. 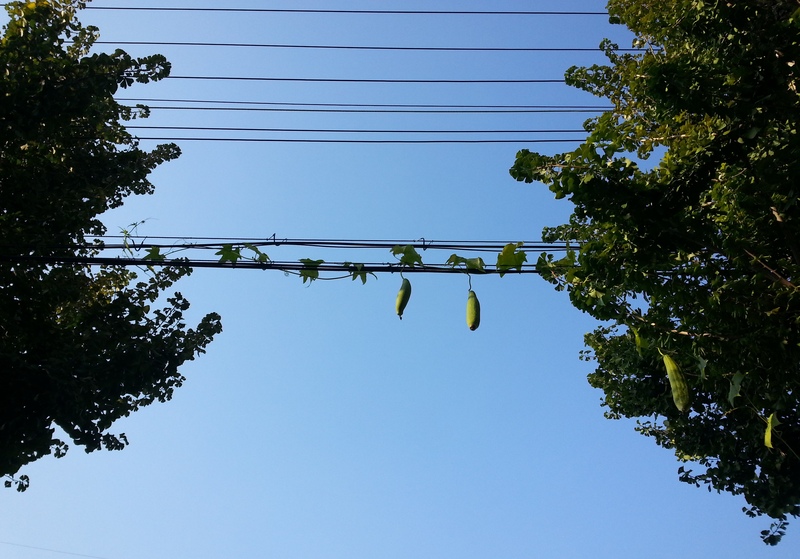 While taking a walk in Eumseong last weekend, I spotted some zucchini clinging to a power line. 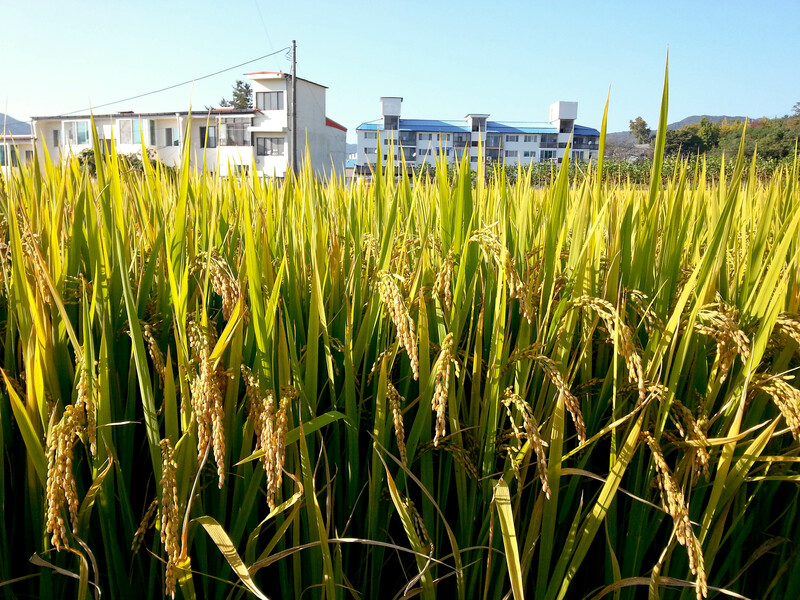 It’s time to harvest the rice. That means winter is coming. 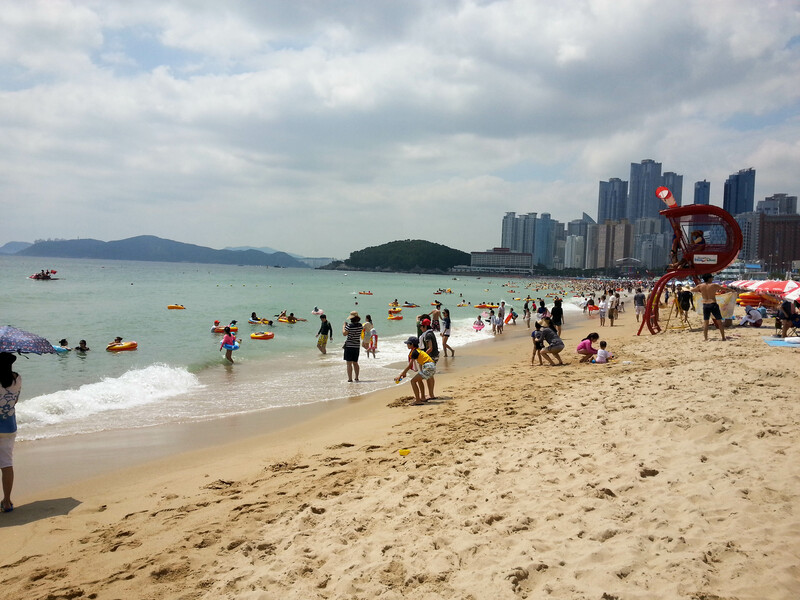 If I were to choose to live in a big city in Korea, I think I would pick Busan. 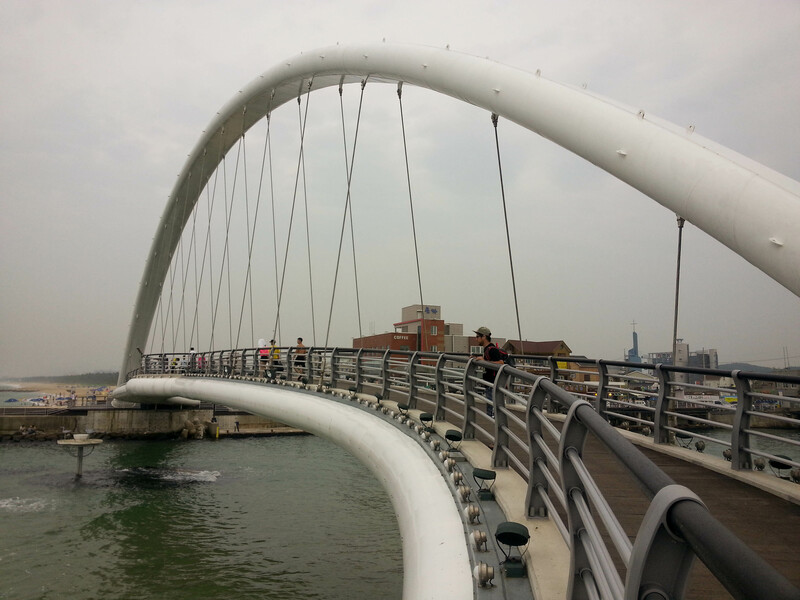 While it’s the second largest city in the country, it has much more of a laid back feel than Seoul. I particularly love its proximity to the sea. David and I spent three days there on our summer vacation and once again, a large chunk of our time was spent at the beach. It rained so much over the course of our two week adventure, so we took advantage of any chance we had to soak up the sun. 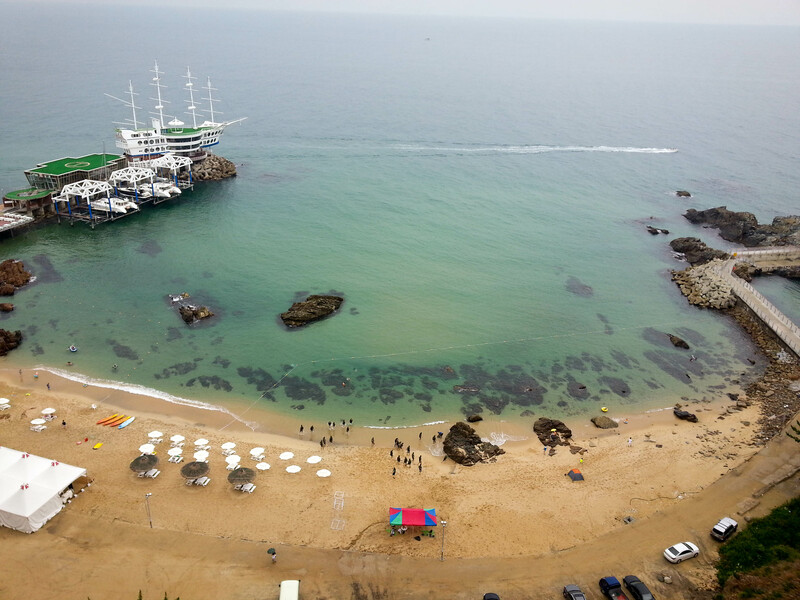 We stayed at a guesthouse in the district of Haeundae, which is located in the southeastern part of the city and known for its nightlife and beautiful beach of the same name. A lot of places are more expensive in this area, especially during “beach season”, but we found a really good deal on a private room at Pobi Guesthouse. Upon arriving, we were pleasantly surprised to found out that it wasn’t exactly a private room, but an entire apartment in a building around the corner from the guesthouse! I believe we were the first people they rented it to, as they said it had just be renovated. In addition to being across the street from the beach, it was cute, spotless and had a kitchen and washer. 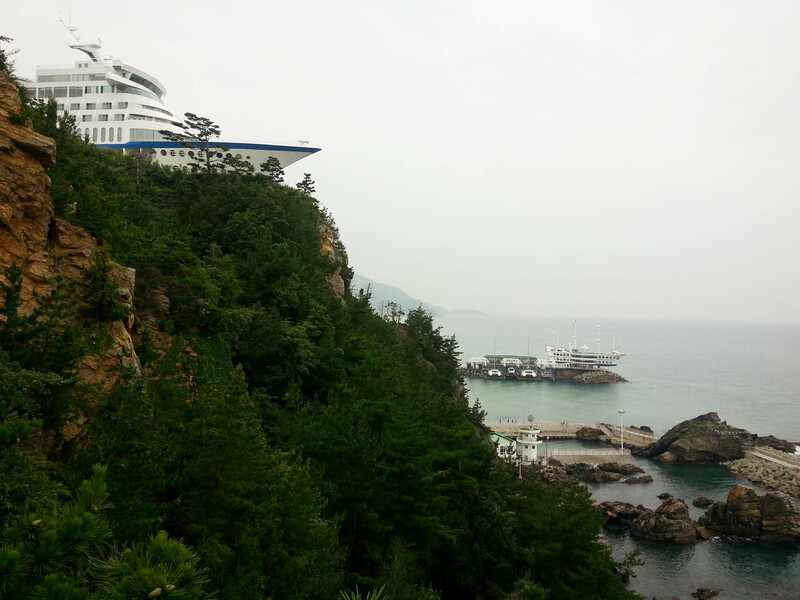 It was definitely an upgrade from the Gangneung beach motel, to say the least. 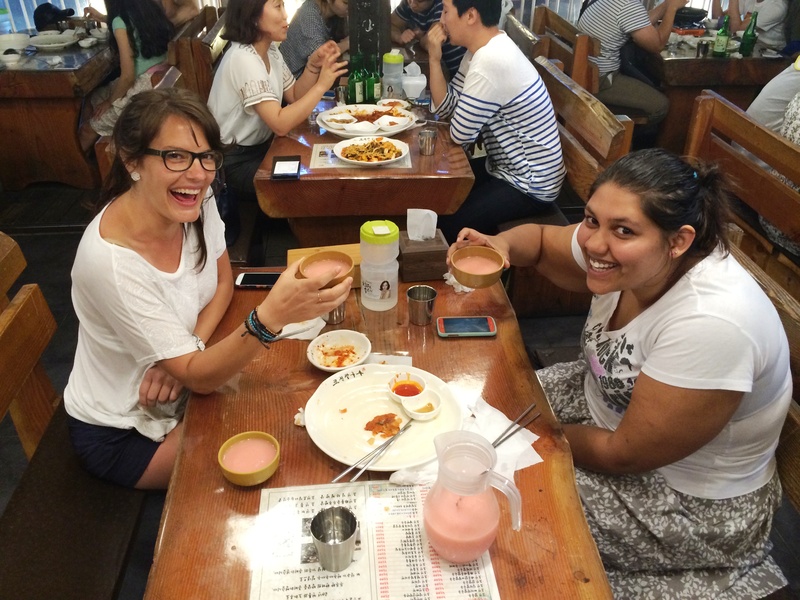 My friend Astrid, who was my roommate during my ten day orientation when I first arrived in Korea, lives in Busan and happily showed us a good time. 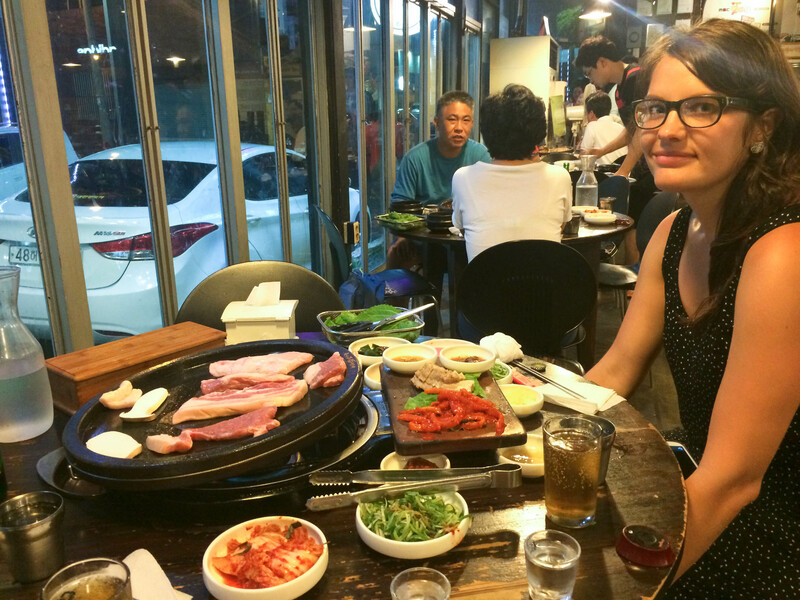 After spending our first full day at Haeundae Beach with her and her friends, we went out for a delicious Korean barbecue for dinner, followed by a tour Gwangalli Beach at night. 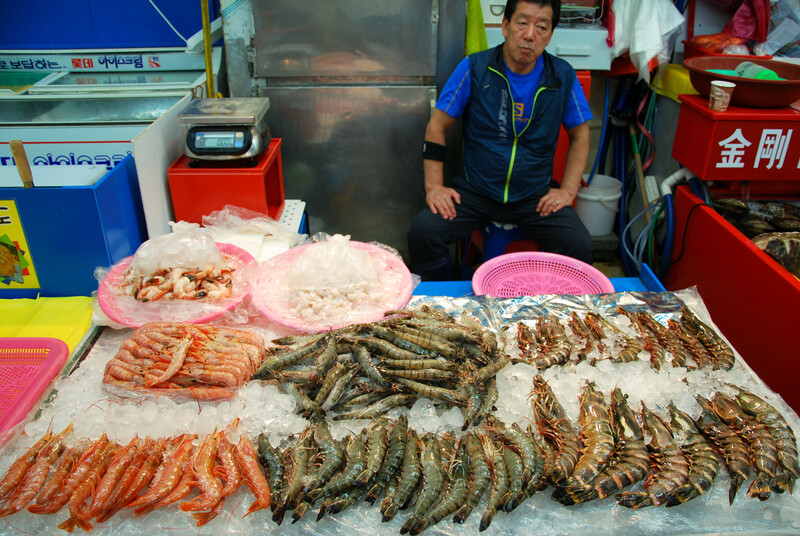 The next day we ate juicy burgers for lunch (I was craving Western food, something you can’t get in my rural town) and then went to Jagalchi Fish Market and Busan Tower. To end it, we enjoyed a very generous amount of makgeoli, which is a type of alcohol made from rice. 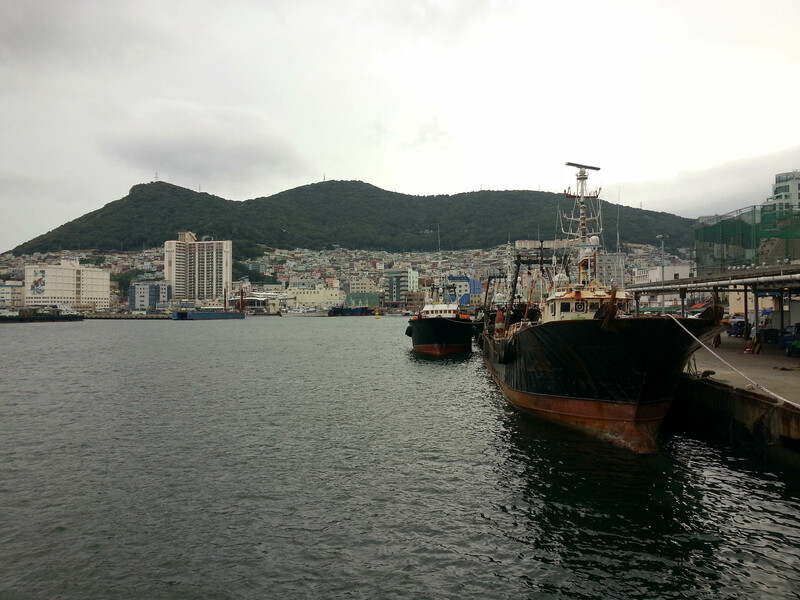 There is so much more to see in Busan, I’m sure. It’s located about three hours by train from my town, so I look forward to going back again soon to see more of what the city has to offer. 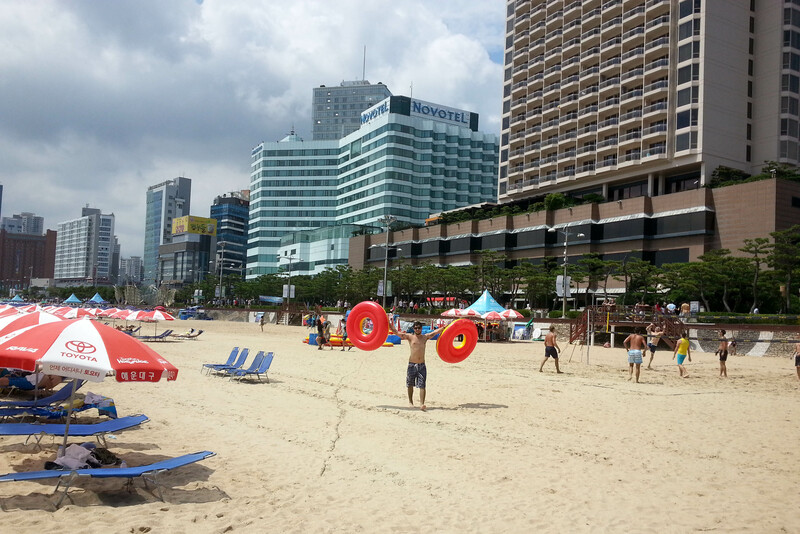 Haeundae is probably the most popular beach in Korea during the summer, so you don’t go here to escape the crowds. We certainly enjoyed it on this sunny day, however. David picked up a few tubes. We couldn’t resist the fun we were seeing people have in the water. 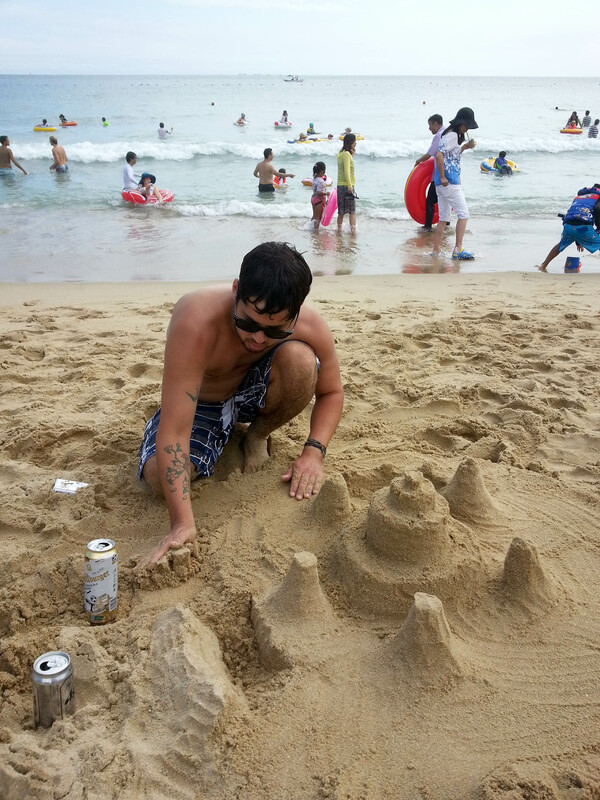 Why not build a sand castle? The water wasn’t as cold as I expected it to be. It was quite refreshing. 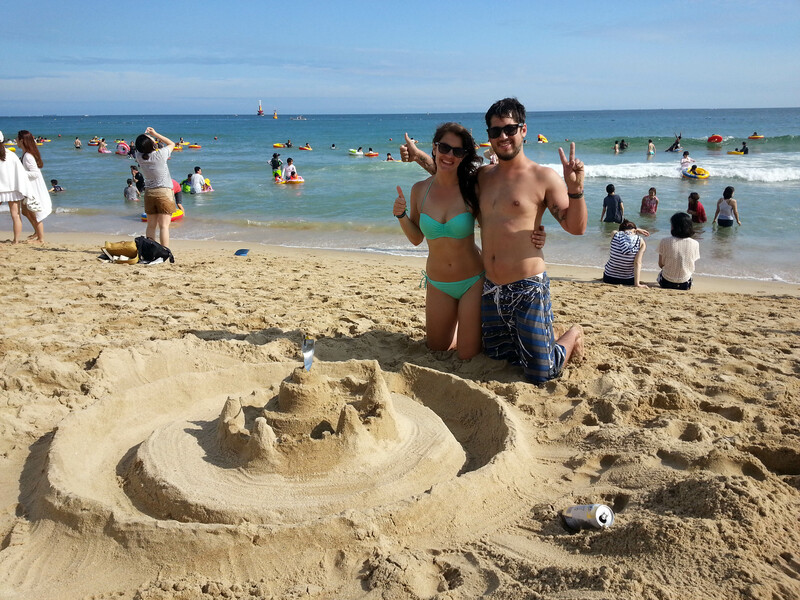 As we sat admiring our work, we decided it definitely wasn’t the best sand castle ever built. People kept stopping to take photos, however, giving us the thumbs up. I guess it was a fine day’s work after all. 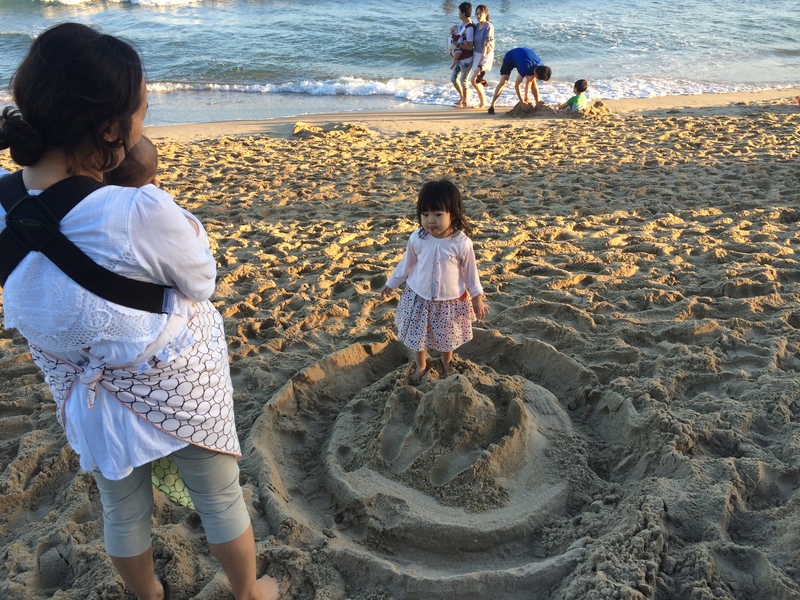 This little girl really wanted to destroy our sand castle. It was adorable. 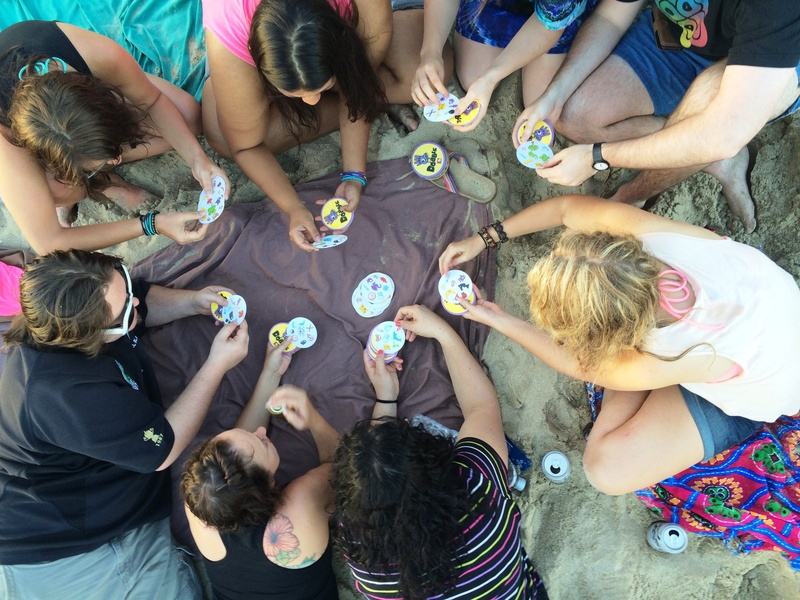 We had some good laughs playing games on the beach with Astrid and her friends. I’m pretty sure this game is meant for six-year-olds, but we proved that adults can have fun playing it too. 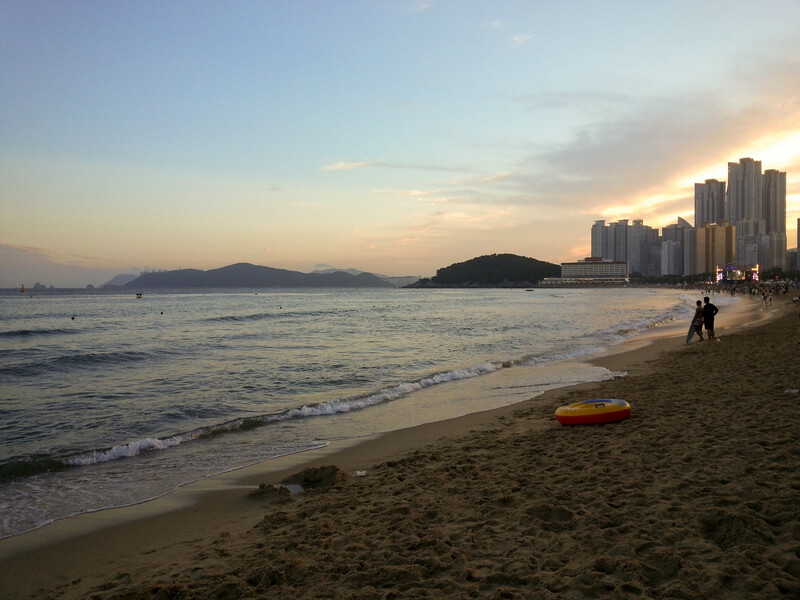 The beach was almost empty by sunset. 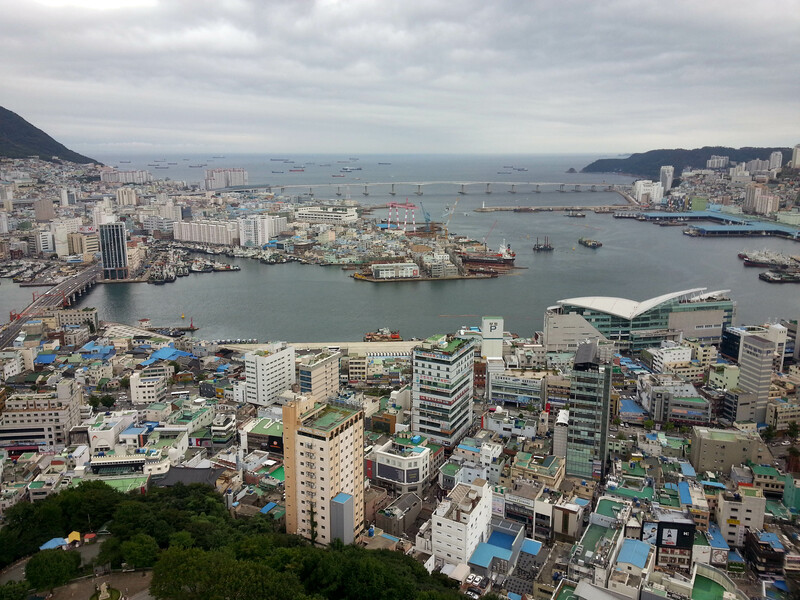 View of Busan and Nampo Port from Busan Tower. 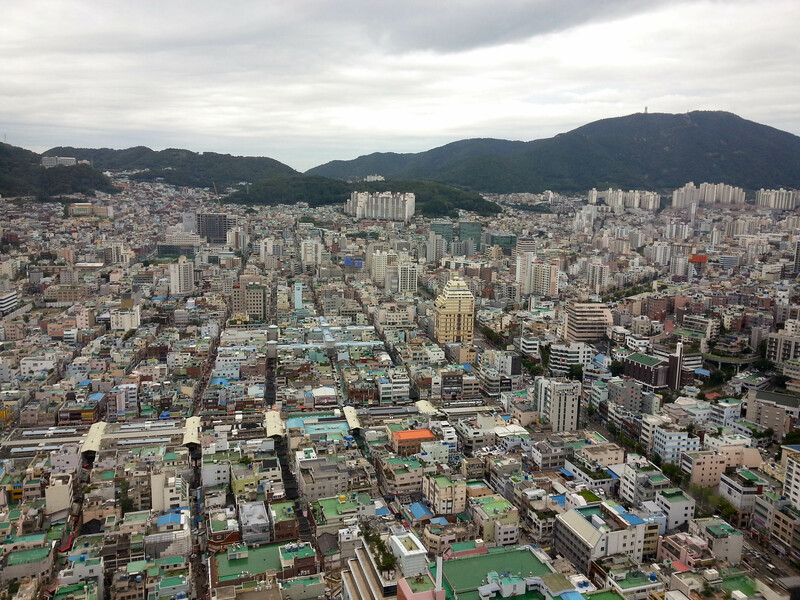 Another view from Busan Tower. So many buildings! There are so many cheesy photo ops in Korea. 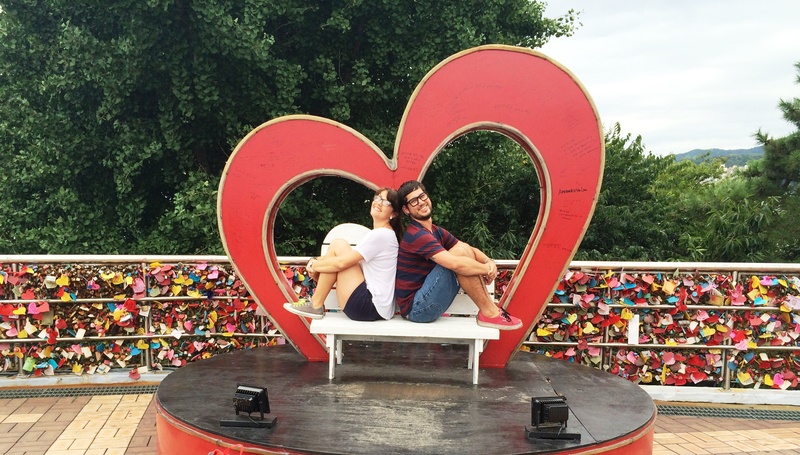 This one is at Busan Tower, with confessions of love locked to the fence behind us. 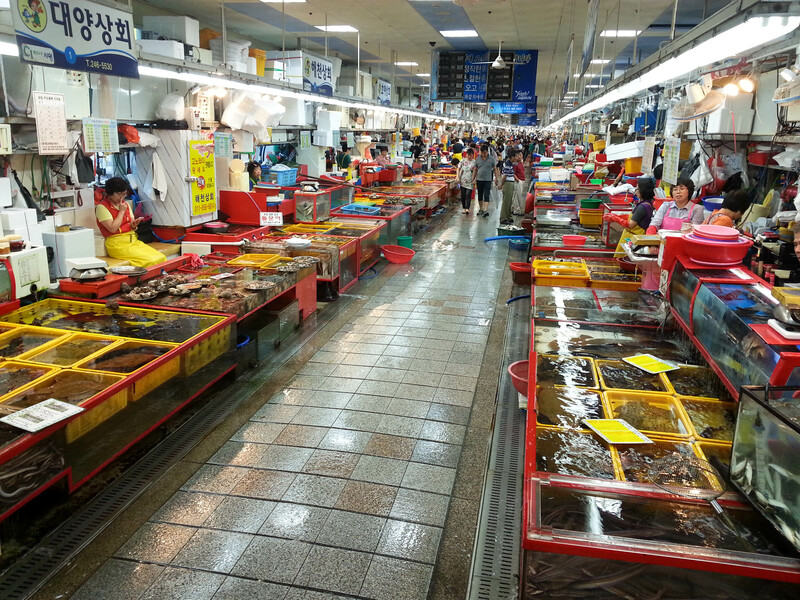 The Jagalchi Fish Market is huge! The rows and rows of stalls seemed to go on forever. 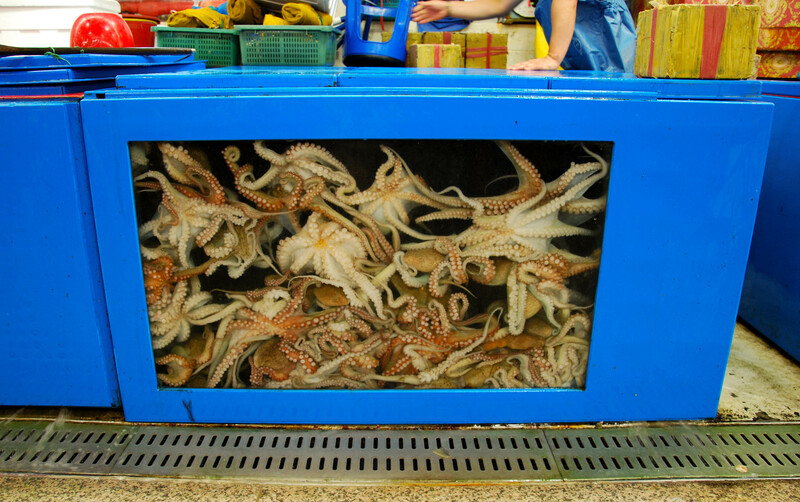 So many tentacles. They look a bit crowded, don’t you think? Look at the size of those prawns! 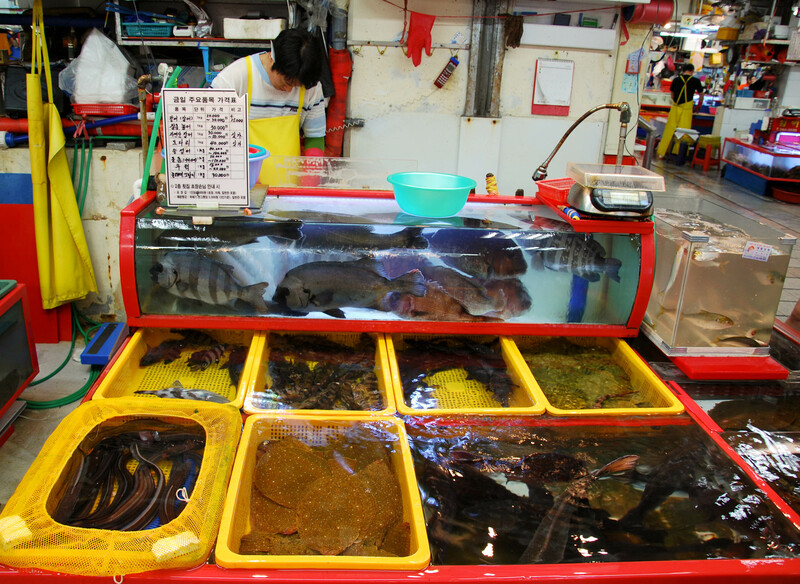 There were many things at this market I could not identify. 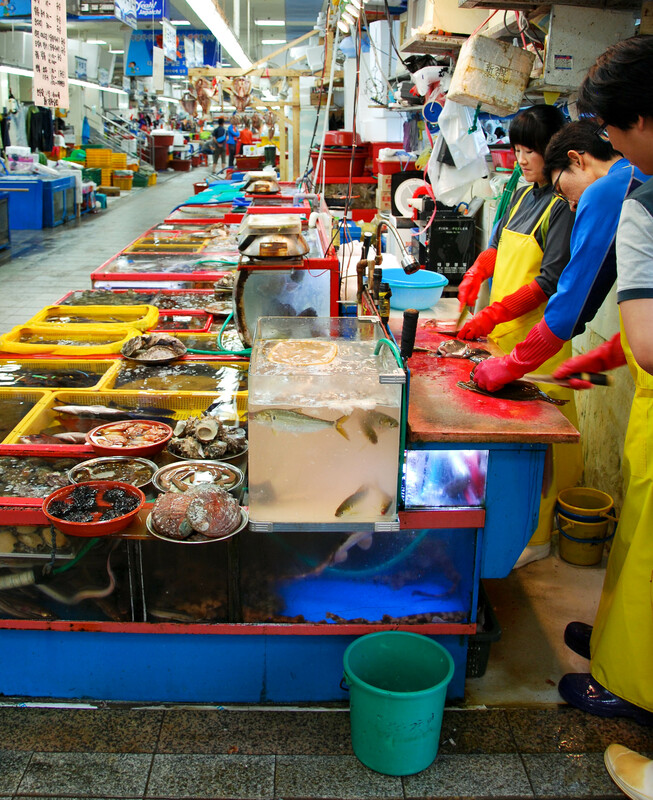 There is a huge dining area in the market as well where you can enjoy the freshly caught fish either cooked or raw. I think this guy is trying to escape. Is it just me, or is that lobster giant? 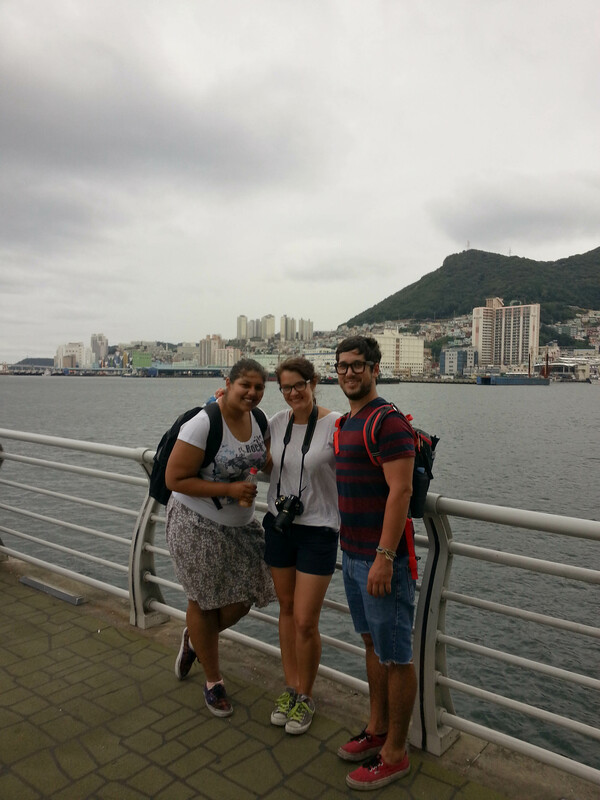 Astrid, David and I outside Jagalchi Market at Nampo Port. 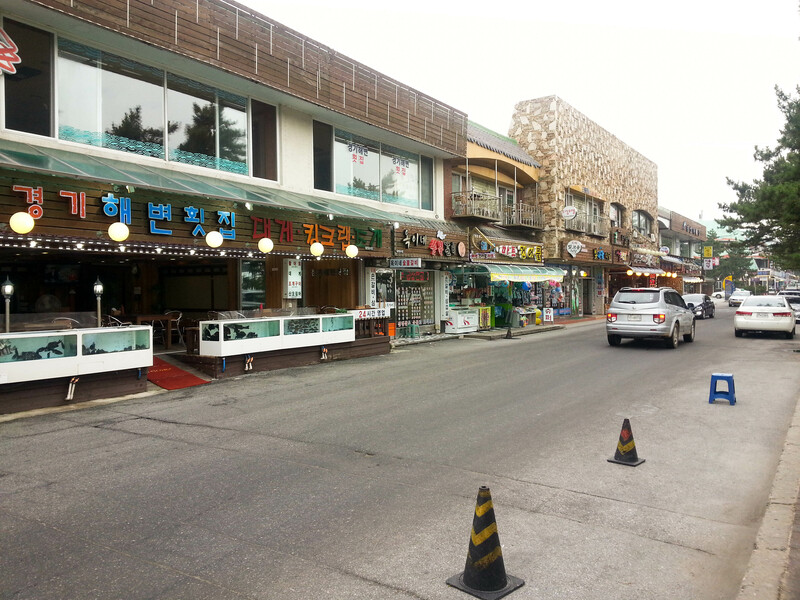 Astrid took us to her favorite place for flavored makgeoli (Korean alcohol made from rice). I believe this was taken while consuming our third pitcher. There are days when I wonder how I got here. I wonder how I came to the decision to quit my good job, get rid of nearly all my belongings and set out for an utterly foreign place far, far from comfort. I wonder why I thought putting myself in an uncomfortable or really challenging situation on a regular basis was a good idea. These thoughts usually come when I’m having a rough day and feel like I don’t have the strength to complete my contract here. Yes, I will admit I have those thoughts where all I want is to come home to a place of ease where family, close friends and IPAs are within reach. I had the same thoughts throughout the first year I lived in Seattle. When I was 22, right after graduating from college, I decided to move from Colorado to Washington and really didn’t put much thought into it. I just did it. I remember my first night in that city so clearly. It was a hot August evening. I was exhausted from driving halfway across the country and moving into my apartment in a city I really knew nothing about. All I wanted was a shower, but I couldn’t find my shower curtain anywhere and it made me so angry. I ended up on the floor in the middle of a bunch of boxes, sobbing, wondering what I’d just done. Why did I just leave the city I’d lived in all my life for a place where I had no job and didn’t know a single person? Why would I put myself in that position? I remember panicking, thinking I’d just made the worst decision ever. But I didn’t. Not only did I grow to absolutely love that city, I grew as a person in so many ways. The people and experiences that came from my decision to take that uncertain path will be cherished forever. 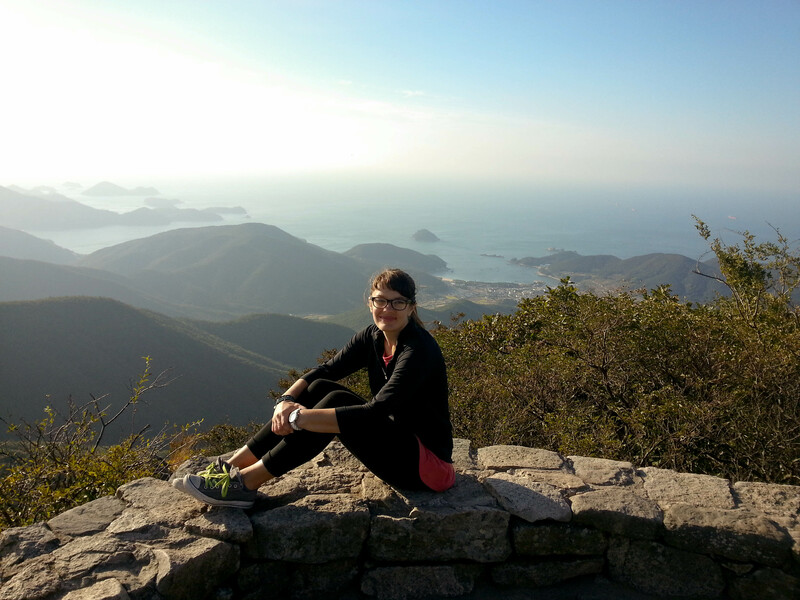 I’m sure I will look back on my year in Korea and feel the same sense of gratification. I know that I will not stay in Korea beyond the end of my contract which means I need to begin thinking about my next move. Where will it be? What will I do? I really don’t know, and not knowing has evoked a lot of anxious feelings. 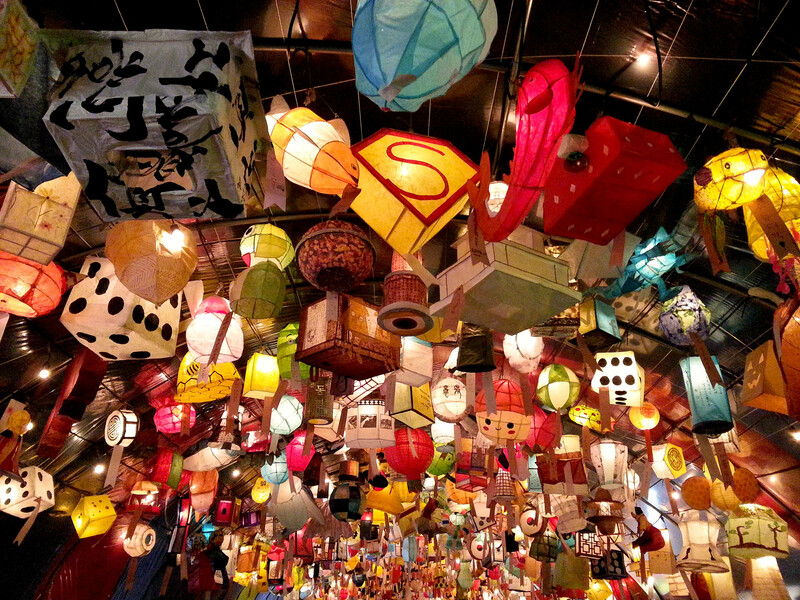 The unknown is a scary place, but it always has a way of unfolding into something beautiful. Perhaps patience is key. Or just trusting that the path I take is meant to be and I will choose it for a reason, even if that reason isn’t known until I’m well on my way. 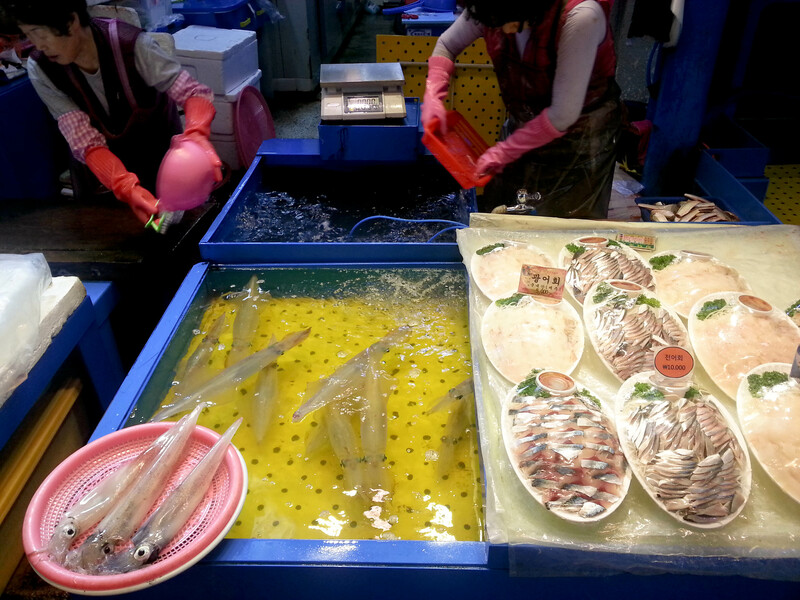 Women sorting though what I think are sardines, but I am not certain. 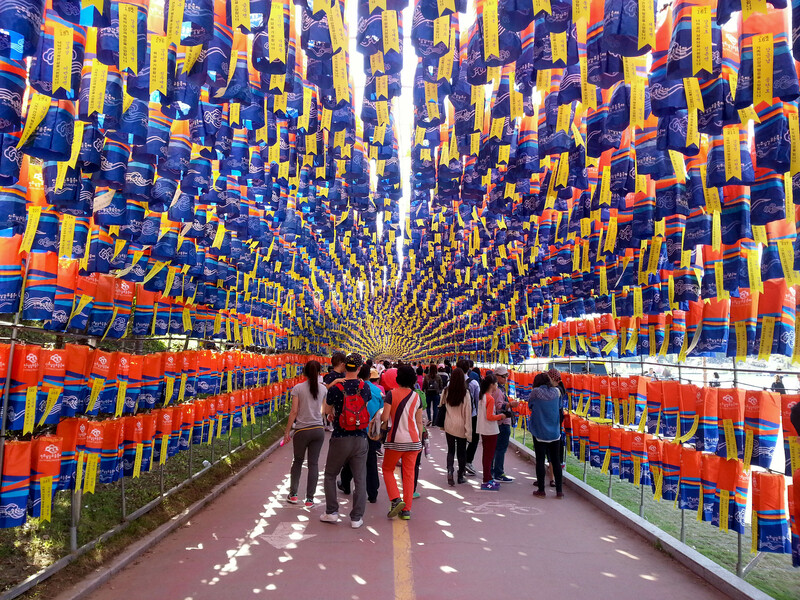 A seemingly endless tunnel of lanterns in the daylight at the Jinju lantern festival. 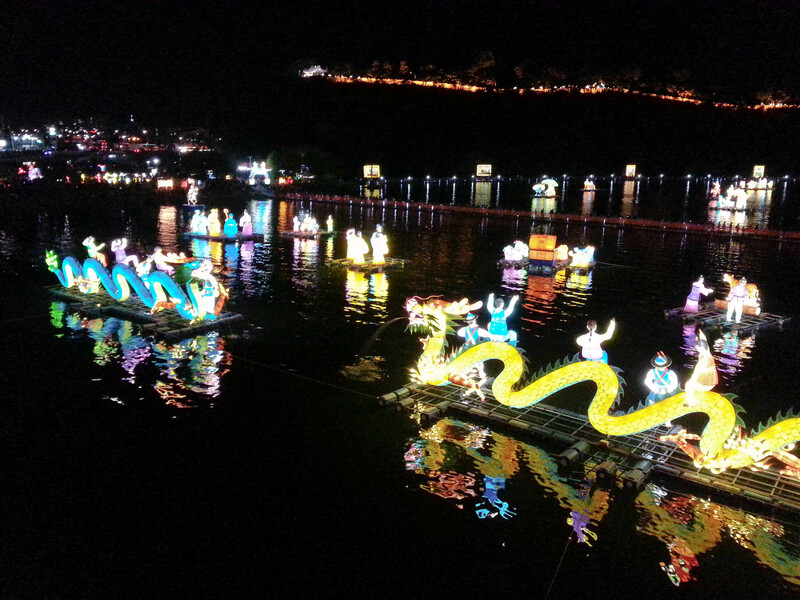 More lanterns at the Jinju Namgang Yudeung Festival. 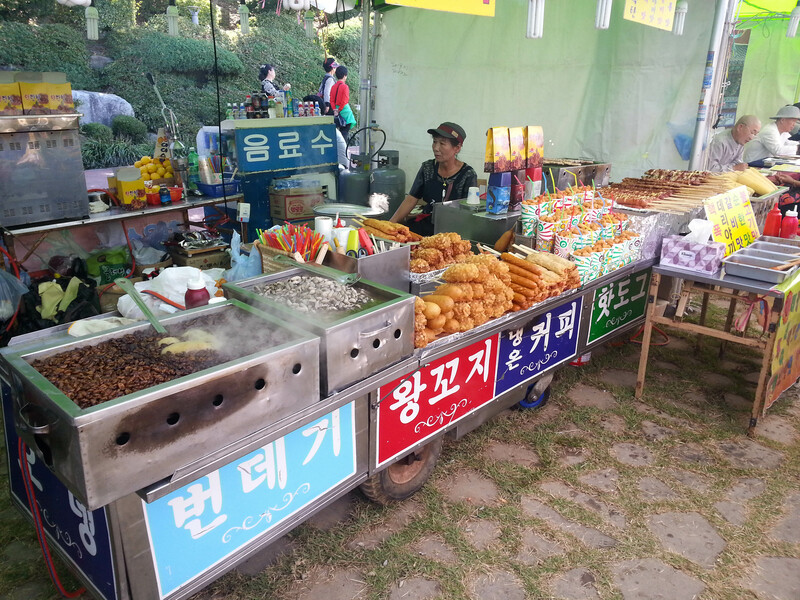 A typical snack booth seen at Korean festivals, which includes bubbling silk worms, corn dogs, fried chicken, chestnuts, and a variety or skewered meat. 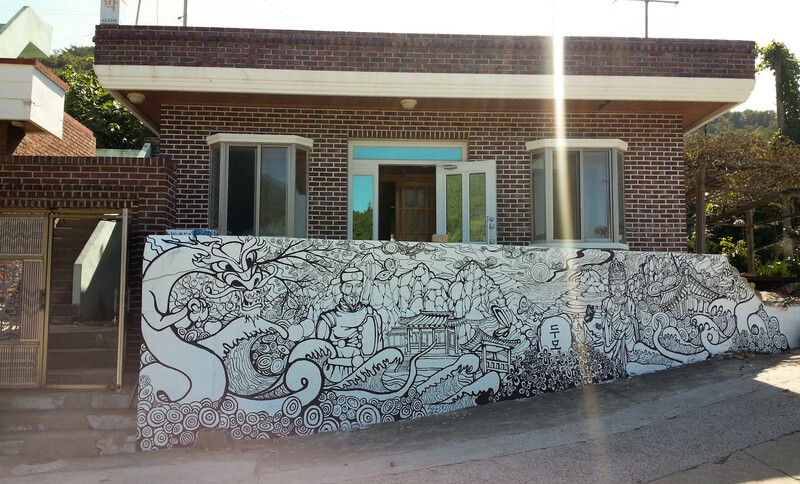 An interesting mural on the wall outside a house in a small village on Namhae Island. 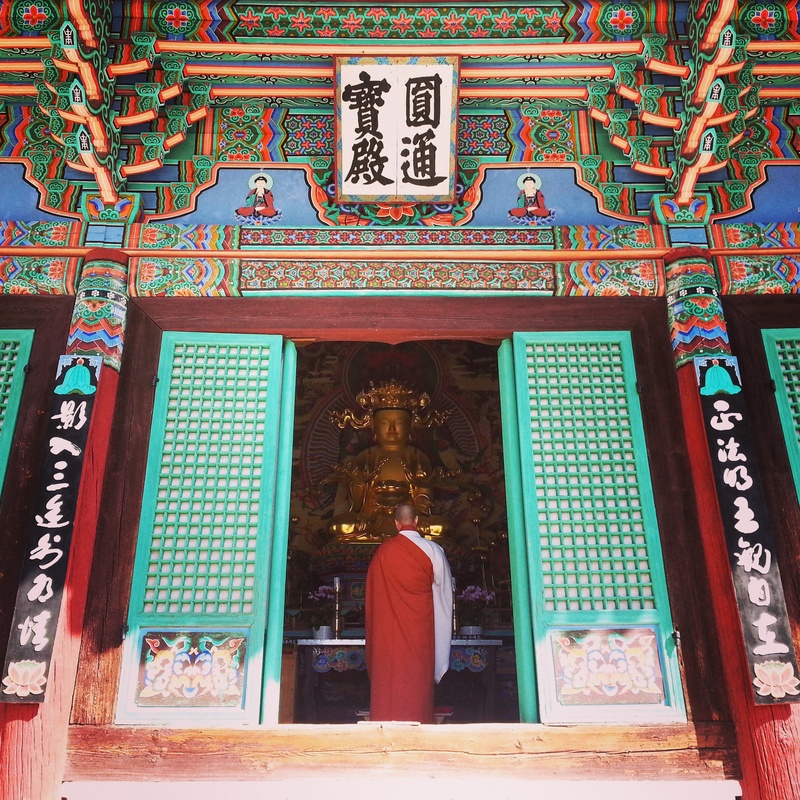 Before leaving Gangneung on a five hour bus ride to Busan and after seeing pictures of Jeongdongjin, David and I decided to spend an afternoon there checking out more of Korea’s eastern coastline. Once again, the day greeted us with endless clouds and rain so it wasn’t everything we’d hoped for, but it was still beautiful. 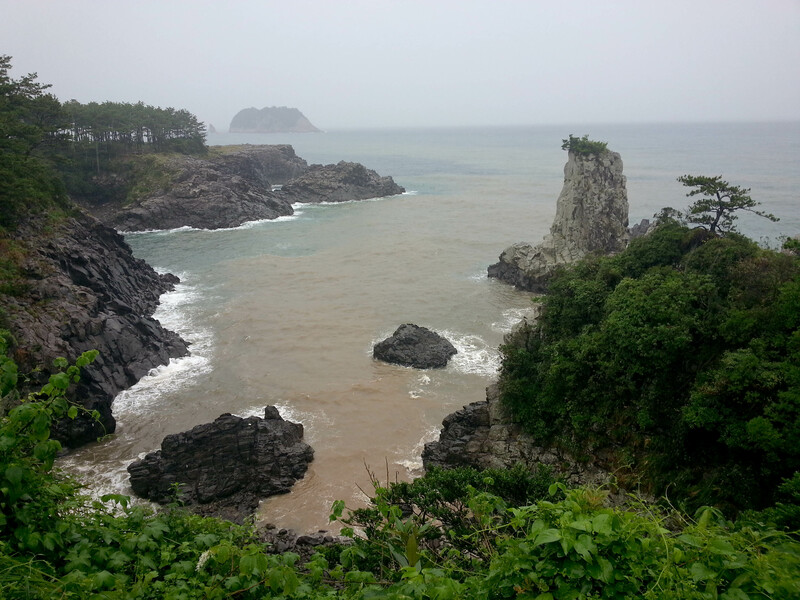 The beach was pretty much deserted due to the rainy weather. Hourglass Park. It takes a year for all the sand to fall through the giant hourglass, making this a popular spot to count down and welcome the New Year. 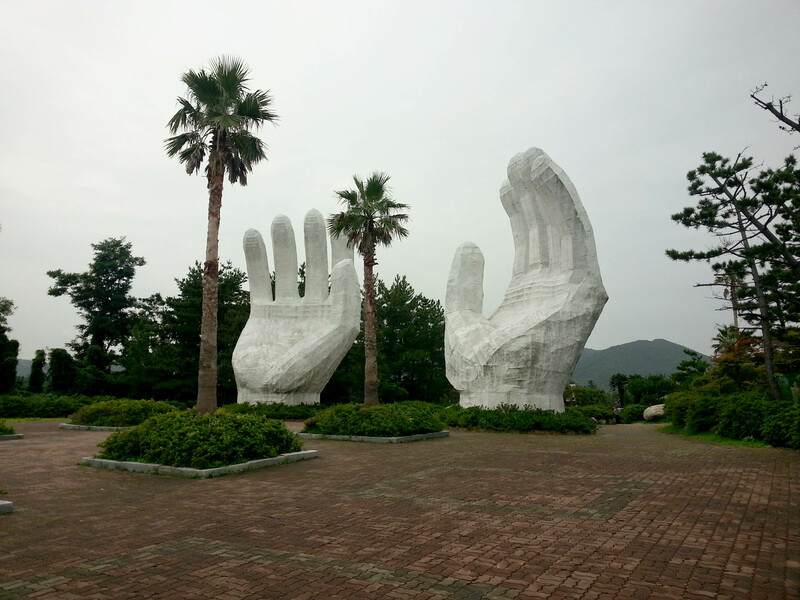 Interesting sculptures on the grounds of the Sun Cruise Resort, a fancy hotel resting on a cliff overlooking the East Sea. 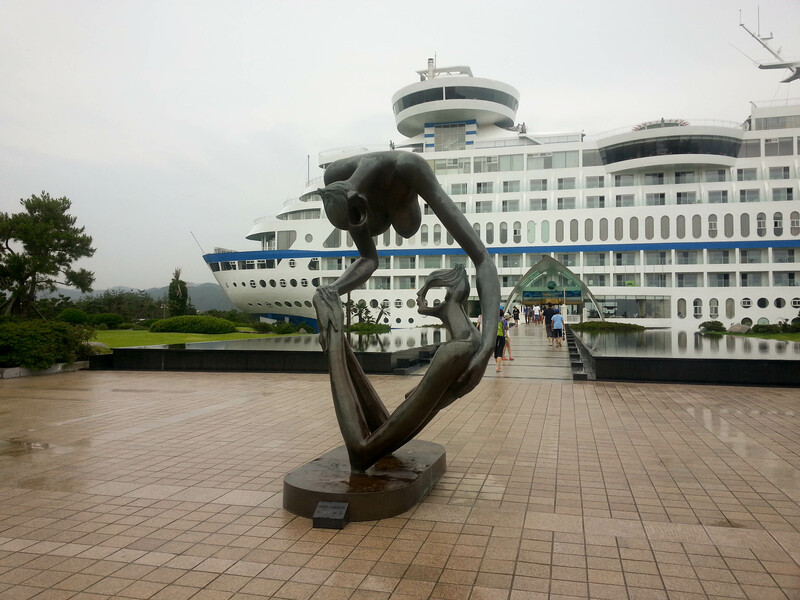 I’ve never seen accommodation quite like the Sun Cruise Resort. 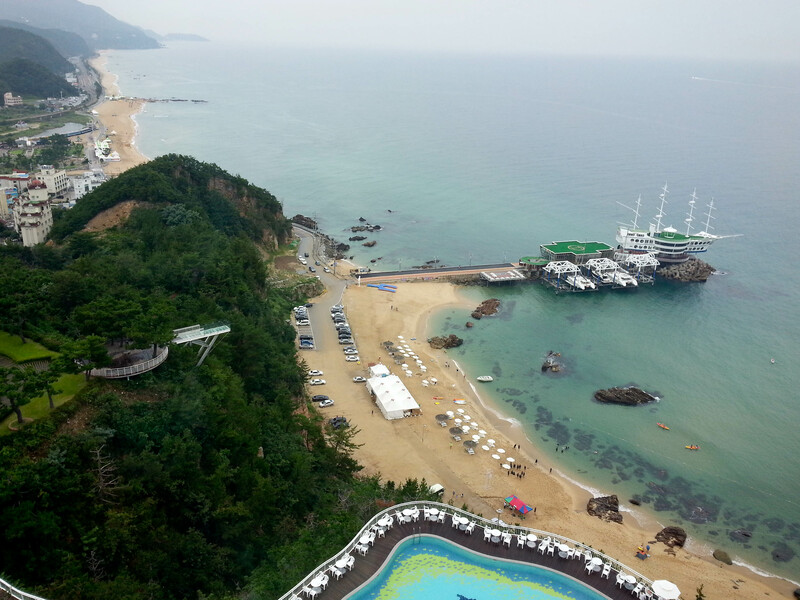 View from one of the observation decks of the resort. 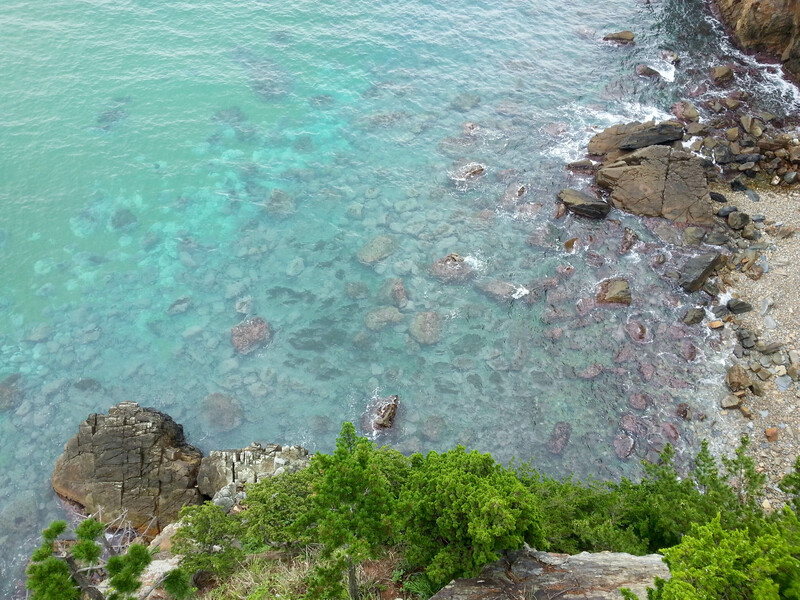 Even under gray skies the sea was showing off its beautiful colors which I just couldn’t get enough of. 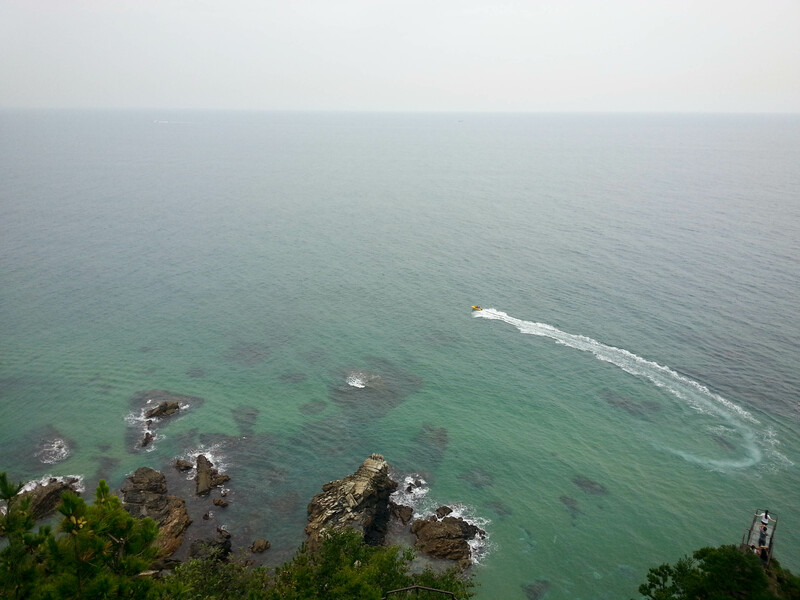 The Korean coastline was so much more beautiful than I imagined it would be. Pretty nice view from the pool. More interesting sculptures on the grounds of the resort. We took a break from the rain and enjoyed a drink in the rotating bar on the top of the resort before heading to the bus station. 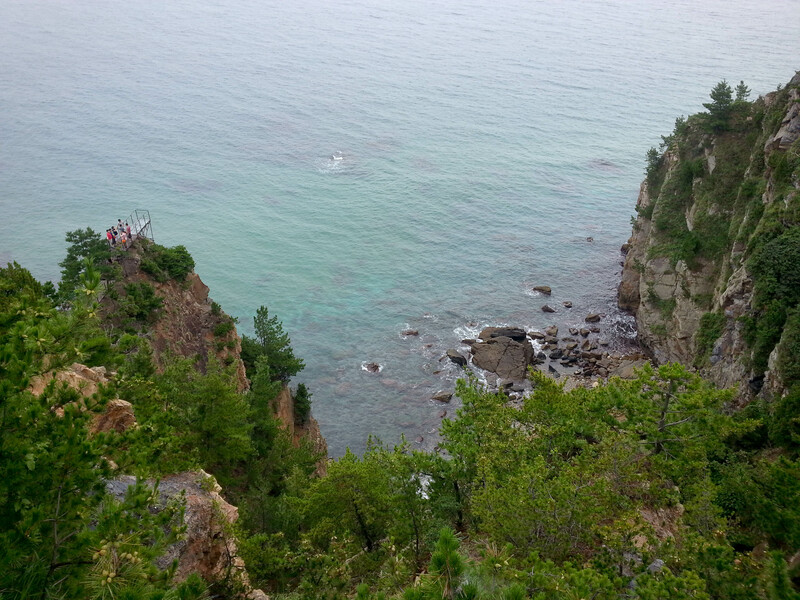 After exploring Sokcho and Seoraksan, David and I hopped on a bus to Gangneung, the second stop on our two week summer vacation. 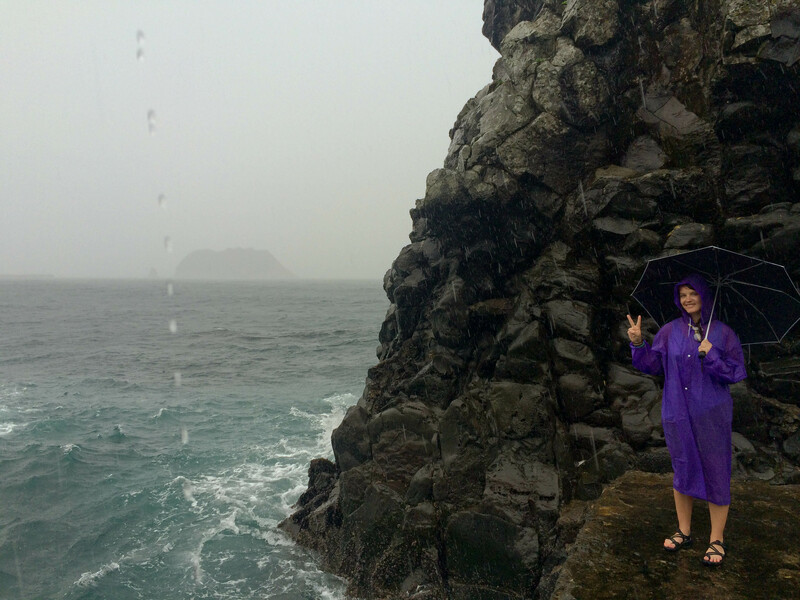 Our original plan was to go to Ulleungdo, a beautiful island 120 km east of the peninsula, but due to bad weather and rough seas, we opted not to. 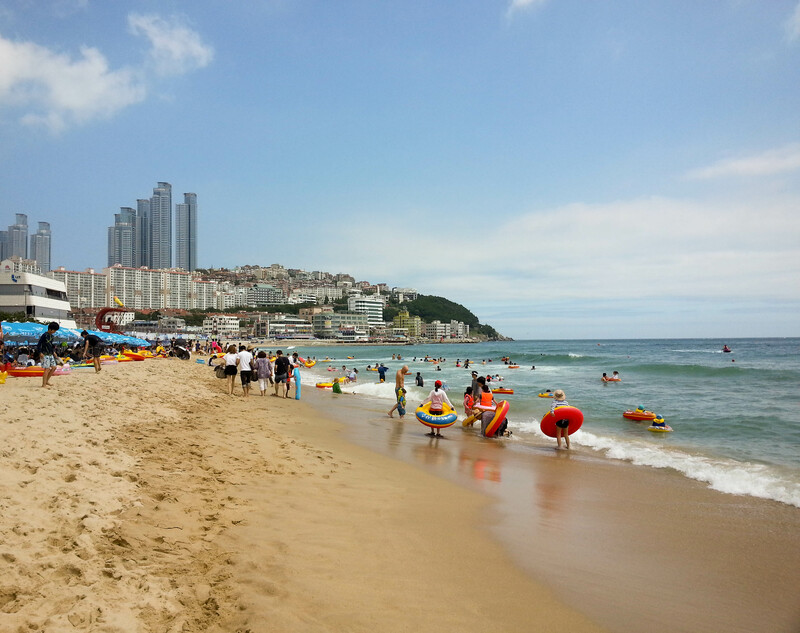 I was a little bummed about skipping it, but Gyeongpo Beach in Gangnueng did not disappoint and provided some really good times and excellent seafood. 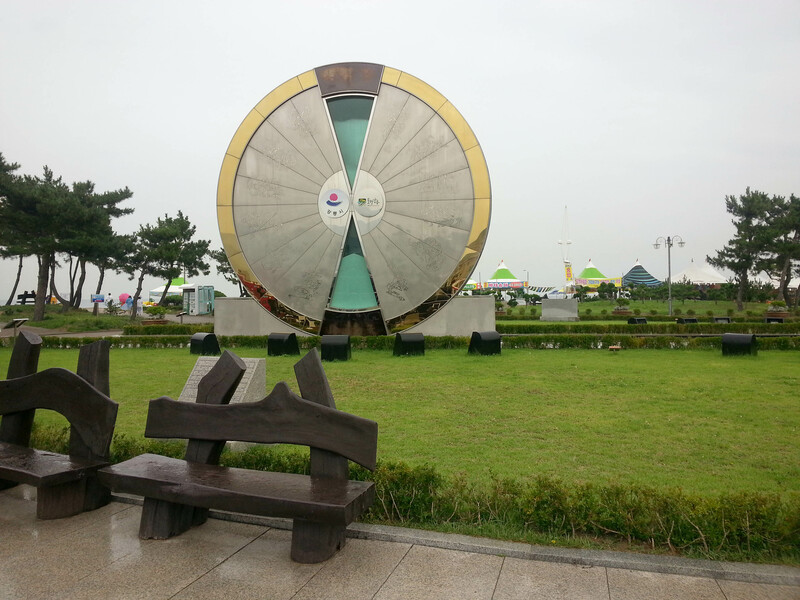 We headed straight to Gyeongpo Beach after arriving at the bus terminal in Gangneung since the sun was actually showing its face (we had a few really rainy days beforehand in Sokcho). 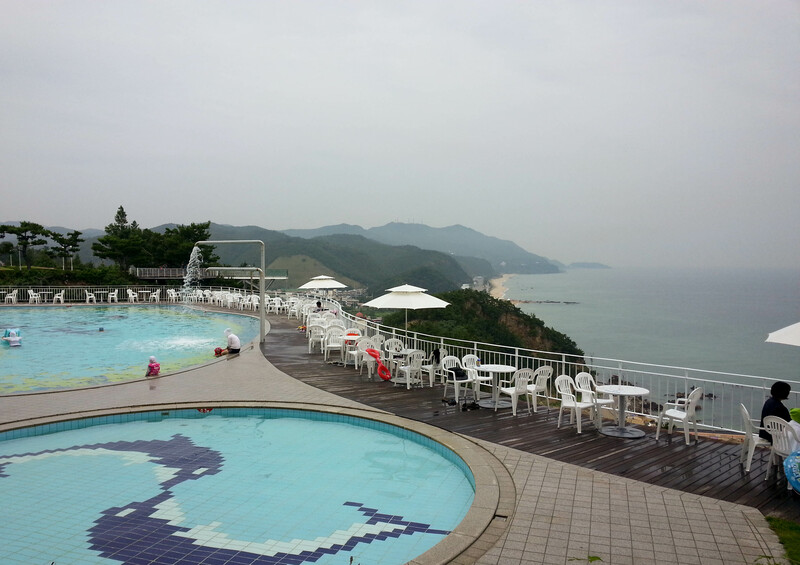 Despite it being peak season for all beaches in Korea we didn’t make reservations for accommodation beforehand, so we were hoping we wouldn’t have any trouble finding a place to stay in one of many motels lining the beach. Luckily, the first place we walked into had an open room for the next two nights, and it even had a balcony overlooking the beach. This wasn’t a luxurious motel by any means, but it was cheap and the location couldn’t have been better. 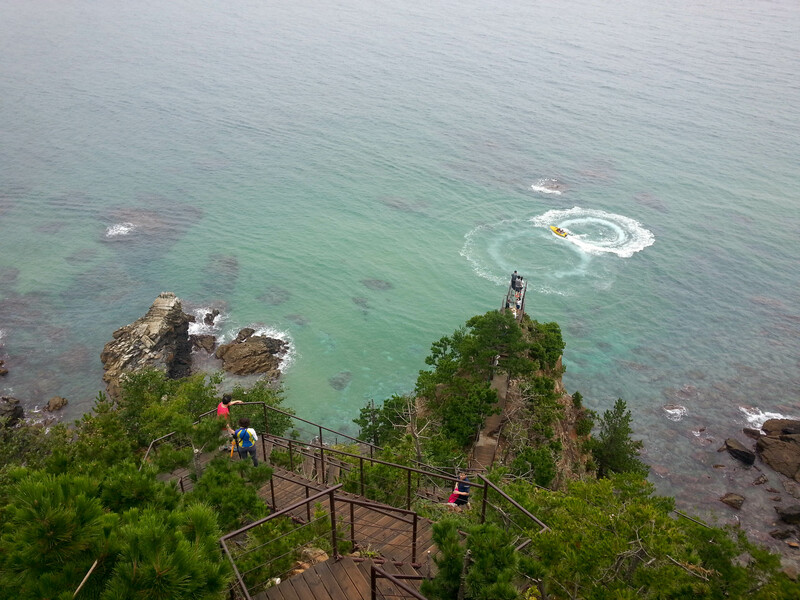 Our time in Gangneung mainly consisted of two things: relaxing on the beach and eating. 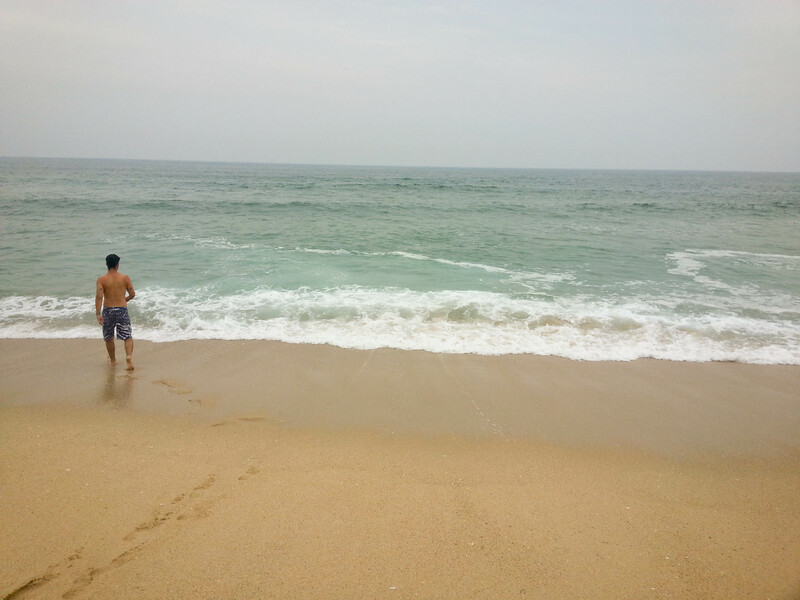 The beach stretches six km along the East Sea and is one of the cleanest I’ve seen in Korea. The water was a bit chilly but really clear. They actually weren’t allowing anyone to go more than ankle deep in the water the the first day we were there (I assume due to larger than normal waves and a strong current), but gazing at the waves crashing against the sand with a brilliant blue sky in the background was enough to make us happy. Unfortunately, we didn’t get to enjoy that blue sky beyond that first day as the next two were overcast and rainy. The amount of excellent food we ate made up for the lack of beautiful weather, however. 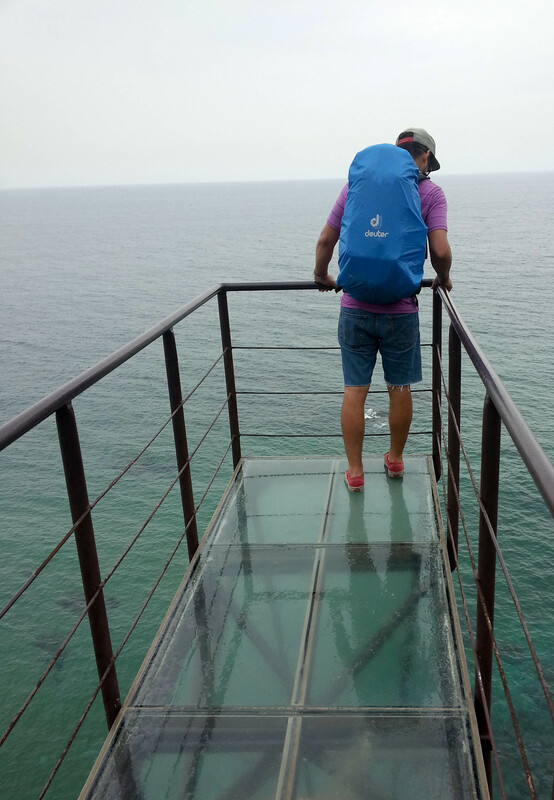 David, the East Sea and Gyeongpo Beach. 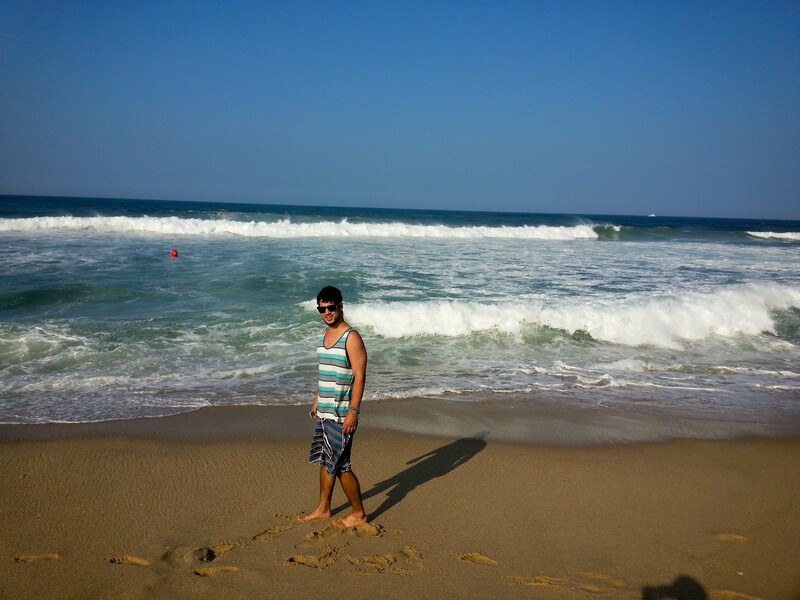 The beach was really clean and beautiful. 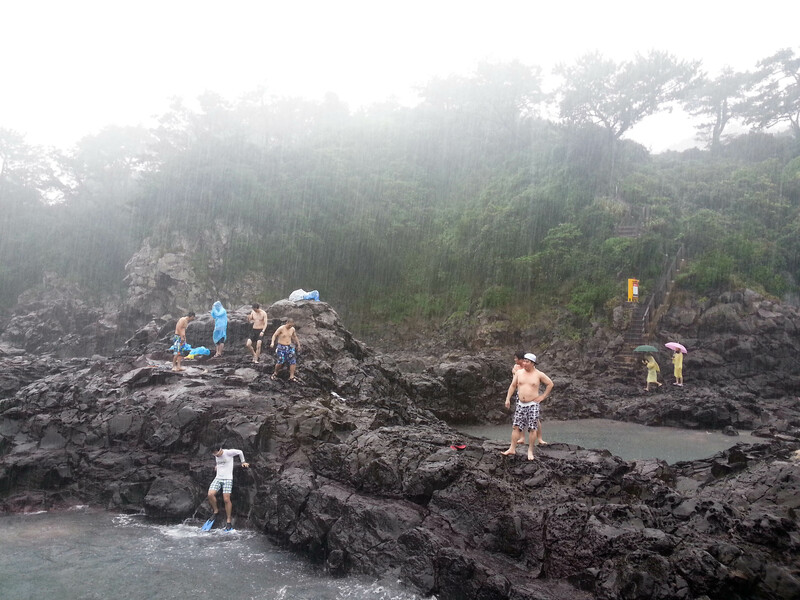 It’s not common to see Koreans wearing actual bathing suits, or if they are they wear clothing over them that they don’t take off (even when getting in the water). 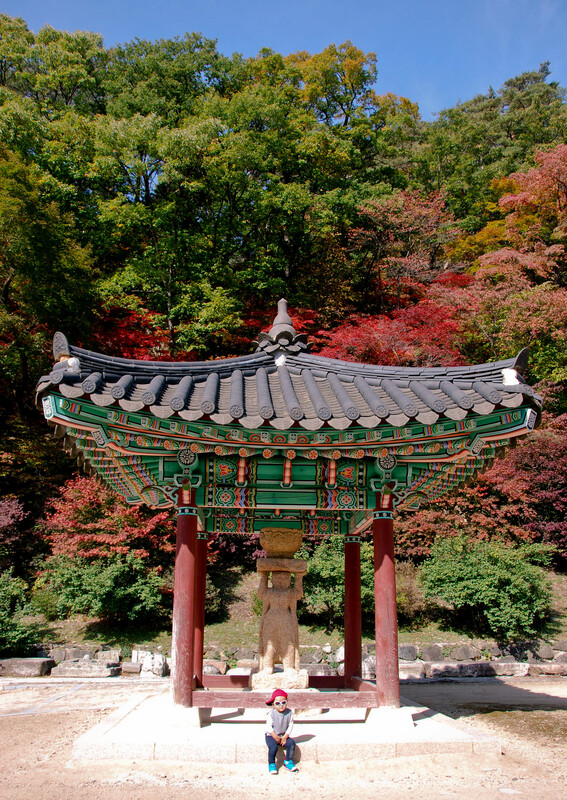 You often see Koreans carrying umbrellas in sunny weather as well. We laughed a lot, like usual. I like what the wind has done to my hair, don’t you? 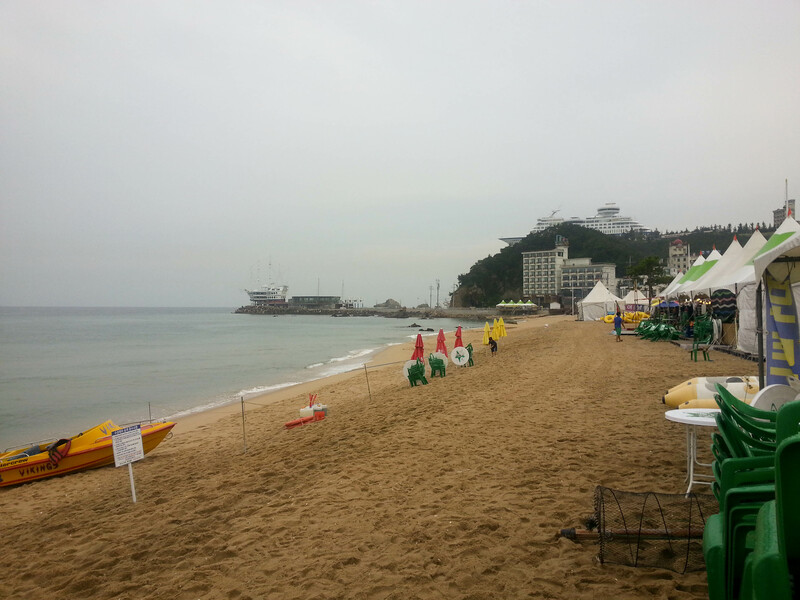 Sand castles against a backdrop of pine trees and Gyeongpo’s strip of seafood restaurants. We enjoyed the freshest sashimi on our first night on the beach. It was amazing. So was the price. 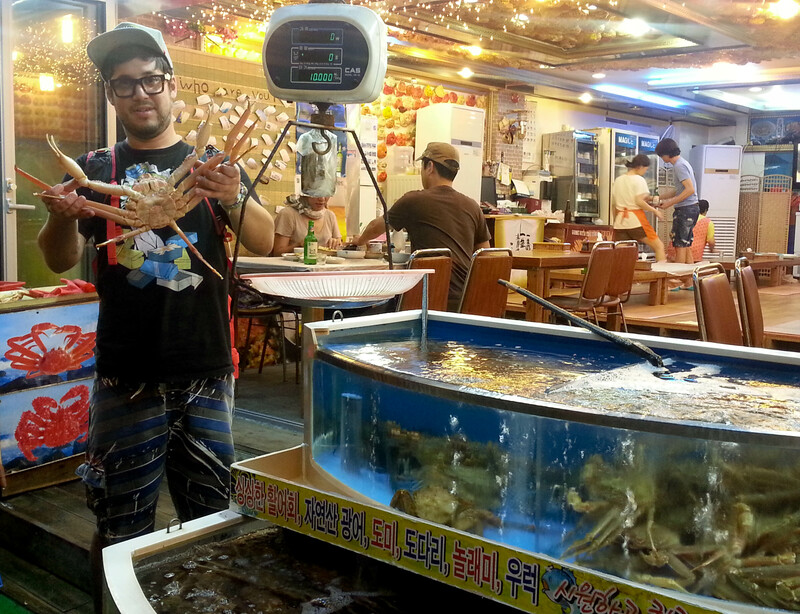 But hey, how often will we get to savor fresh seafood on a beach in Korea together? I thought you might like to see another angle of the delicious spread. 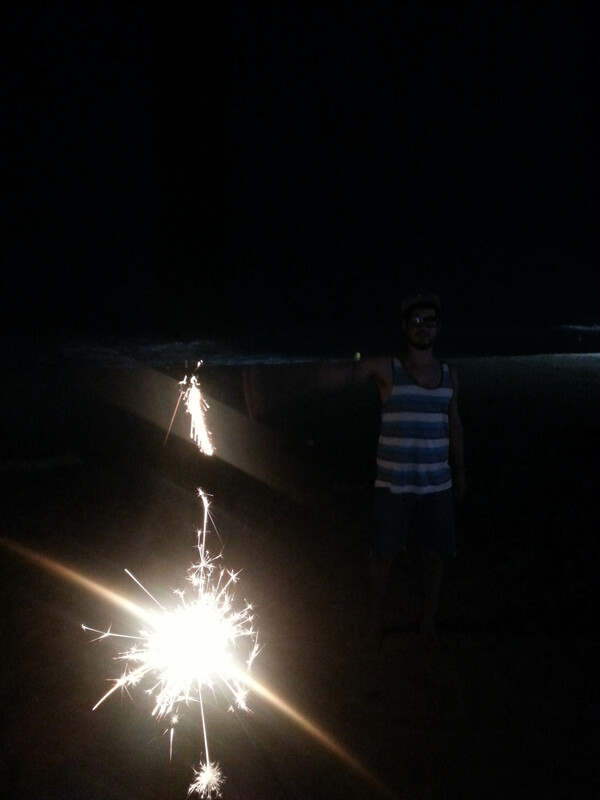 After dinner, ignoring the sprinkling rain, we lit fireworks and sparklers on the beach. 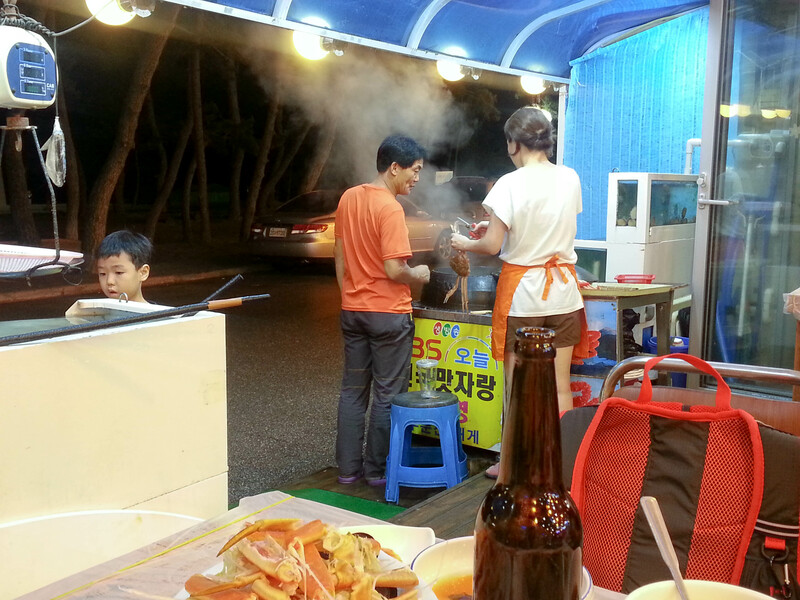 Fireworks are legal and sold everywhere in Korea, especially near beaches. Unfortunately, we woke up on the second morning to see the sun decided hide from us again. That didn’t stop us from having fun, though. Moments before David was yelled at by several lifeguards for getting in the water without a flotation device. 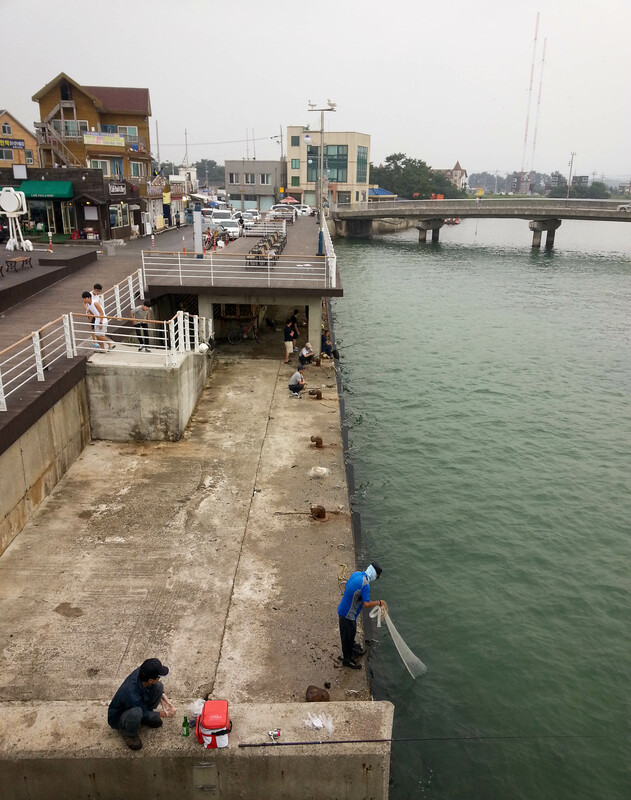 I’m guessing a day of fishing in Gyeongpo isn’t complete without soju (note the bottle in front of the guy crouching at the bottom). 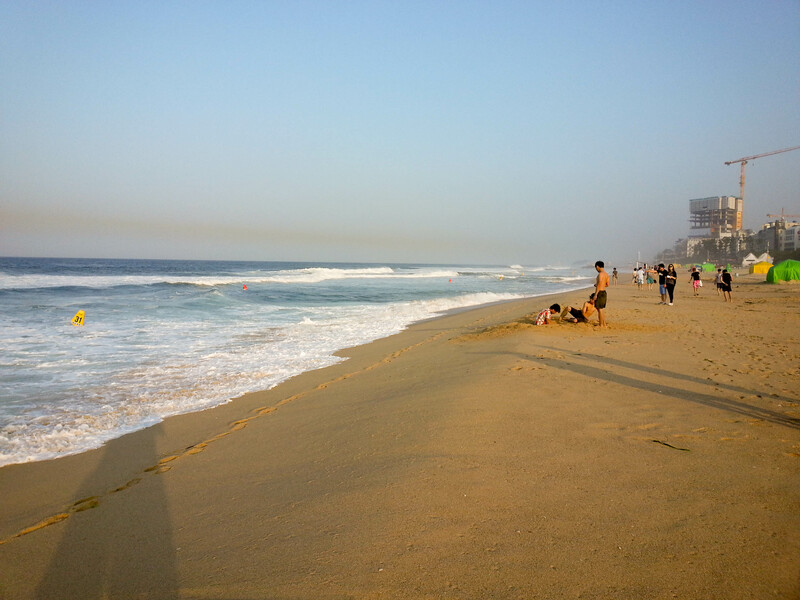 The main “strip” along the beach that was filled with sea food restaurants and motels. 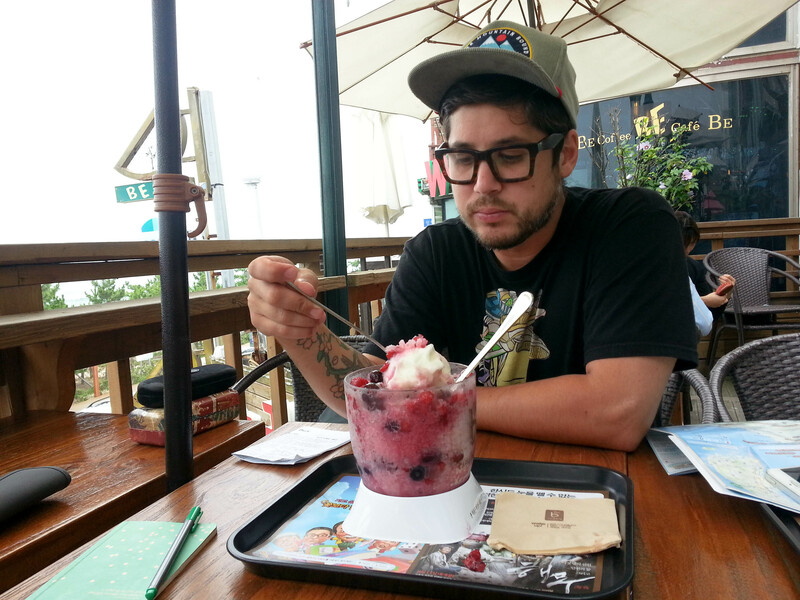 Taking a break from the rain to enjoy bingsu. 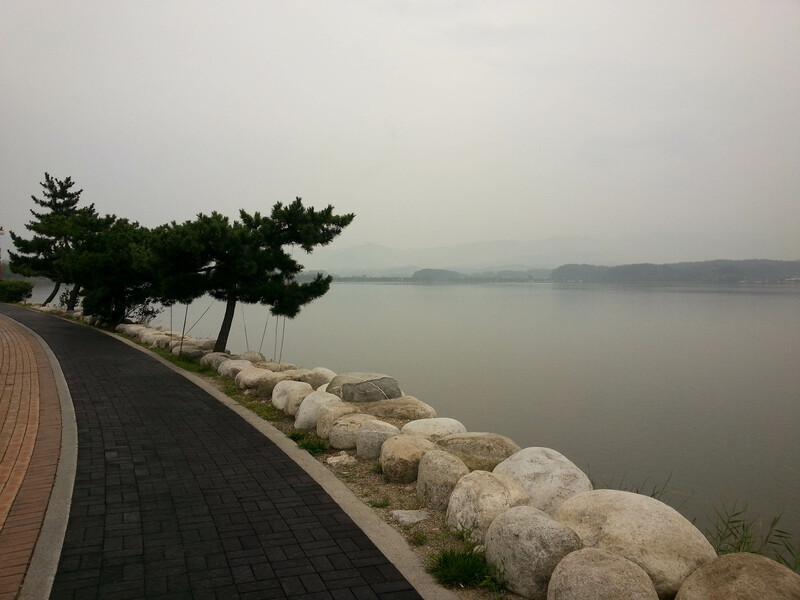 The lovely path that wraps around tranquil Gyeongpo Lake. 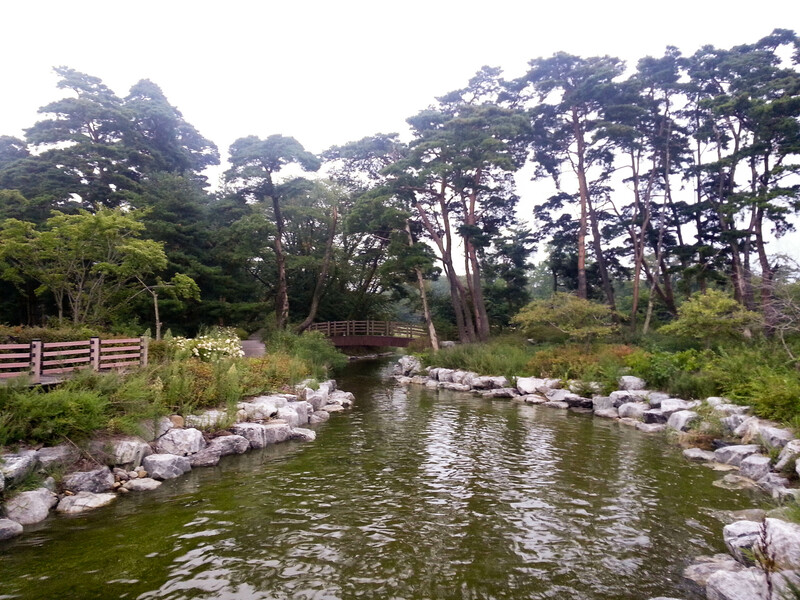 A pretty little park next to the lake. 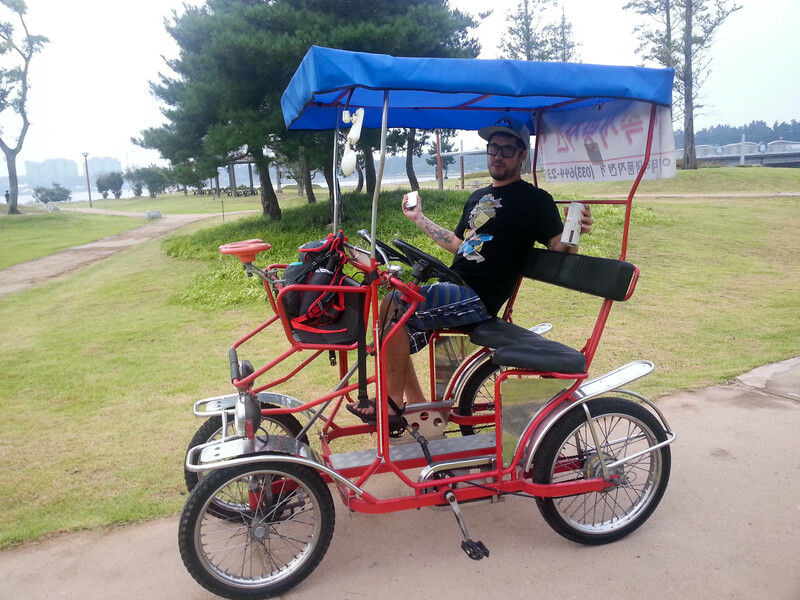 We rented this awesome ride for an evening cruise around the lake. I took the driver’s seat, of course. 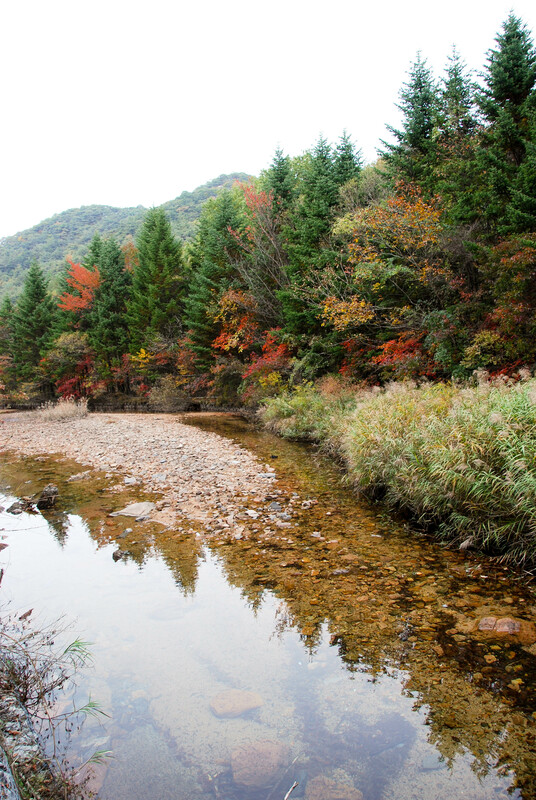 A beautiful stream alongside Gyeongpo Lake. David picked out our main course for dinner. 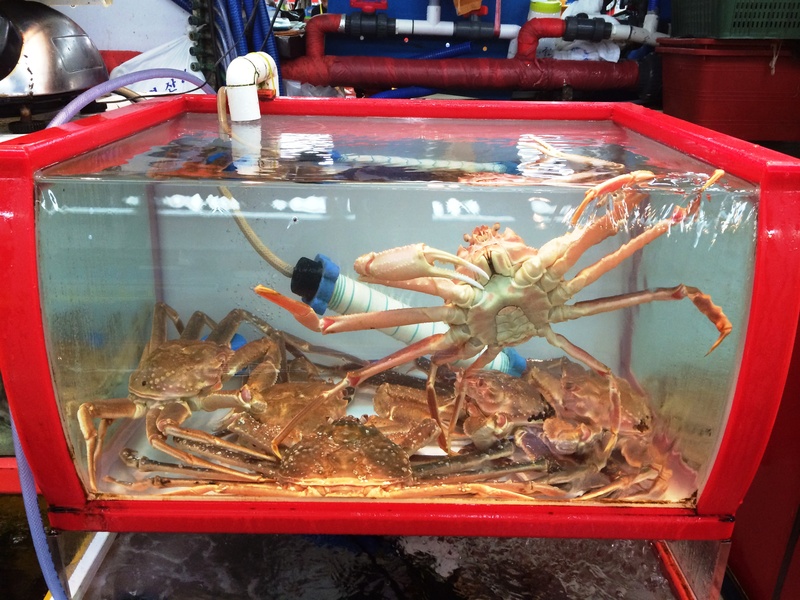 I think the boy is pondering what he just ate for dinner while our crab is about to be steamed. 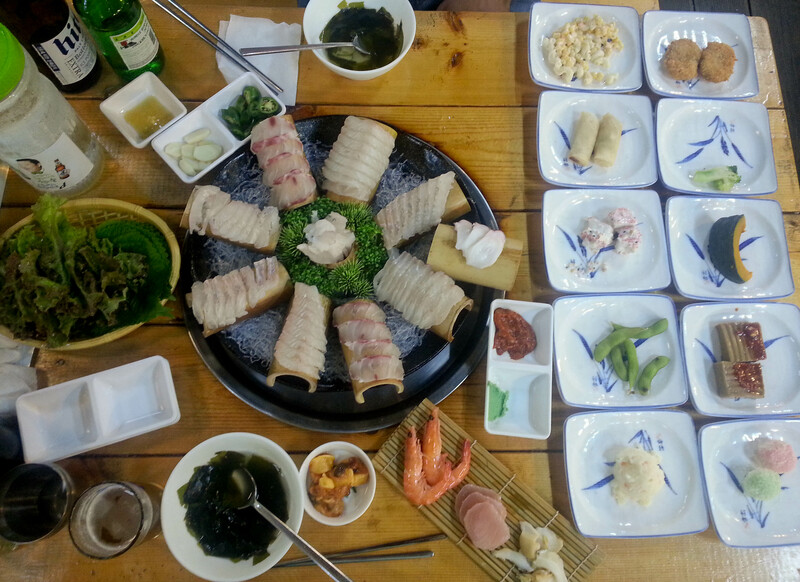 We splurged again on a delicious beach side dinner of crab and a ton of banchan (side dishes). 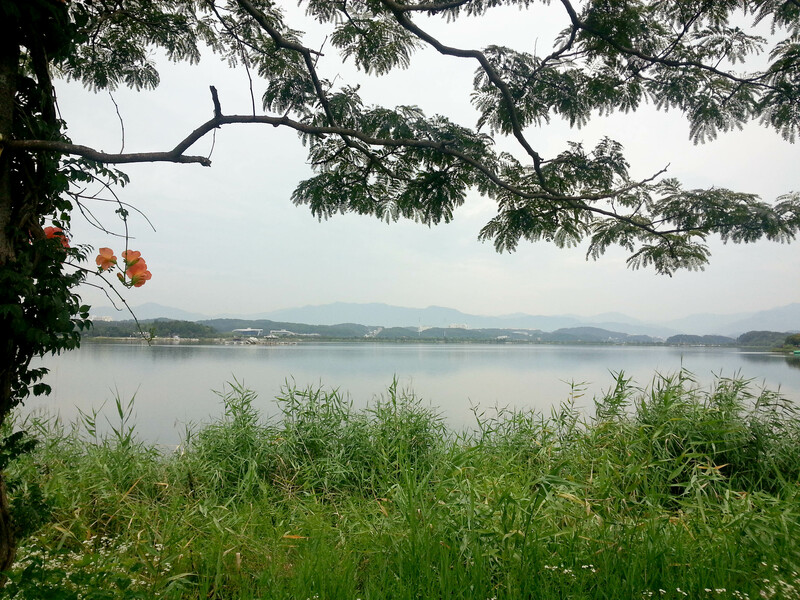 A serene morning at Gyeongpo Lake.